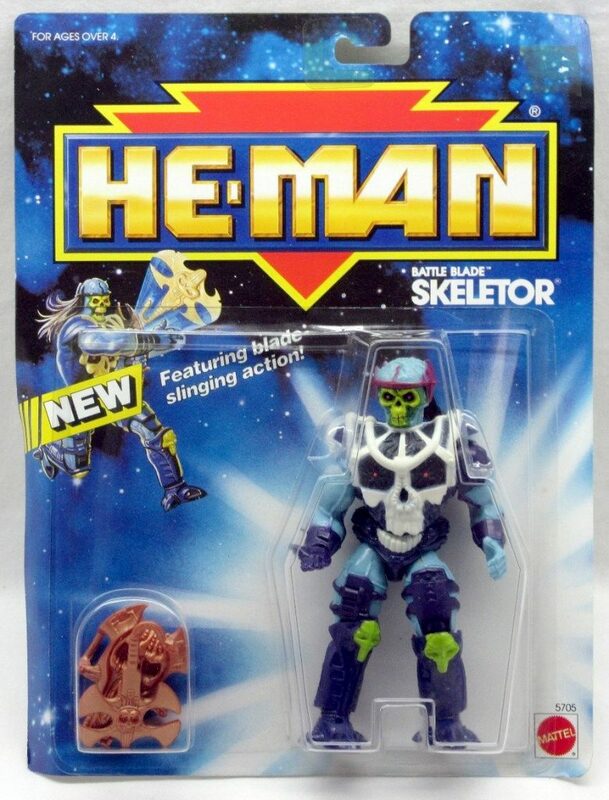 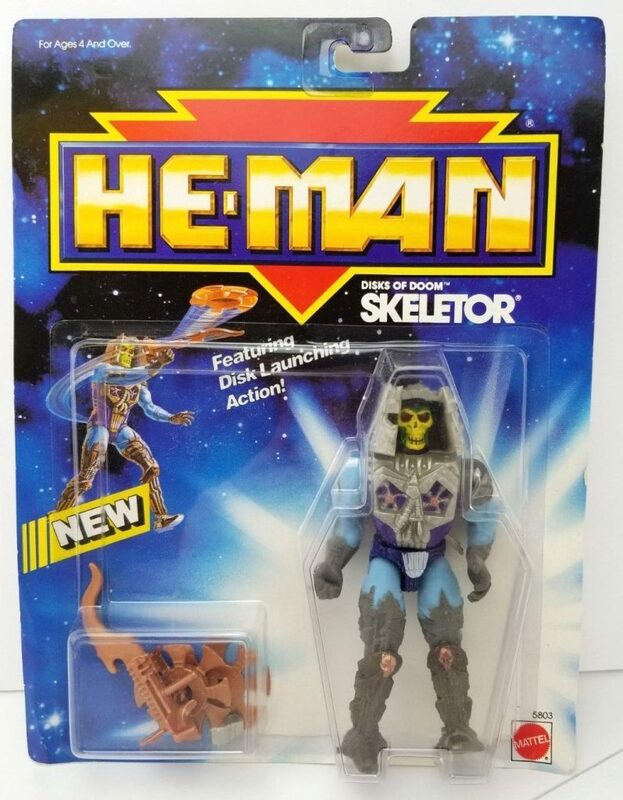 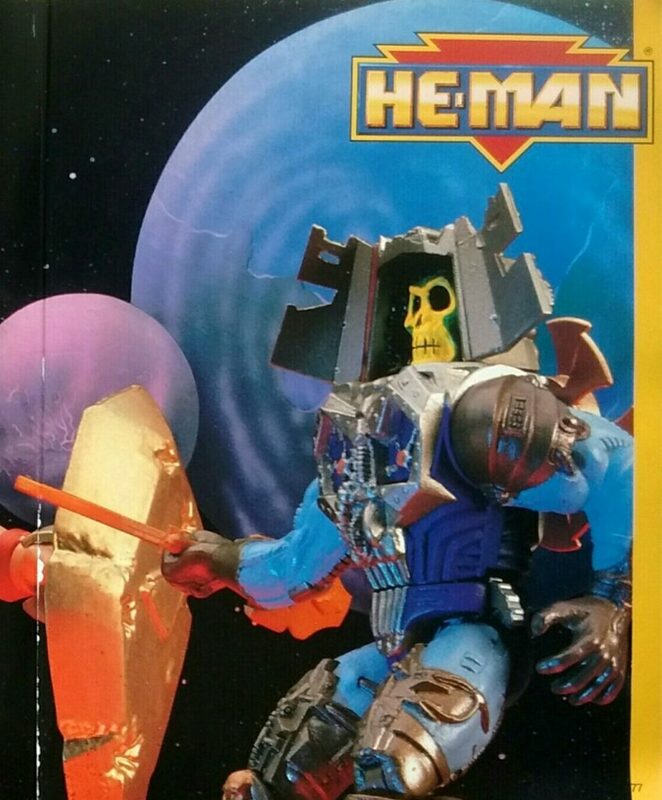 Battle Blade Skeletor is the last Skeletor variant produced in the New Adventures of He-Man toyline. 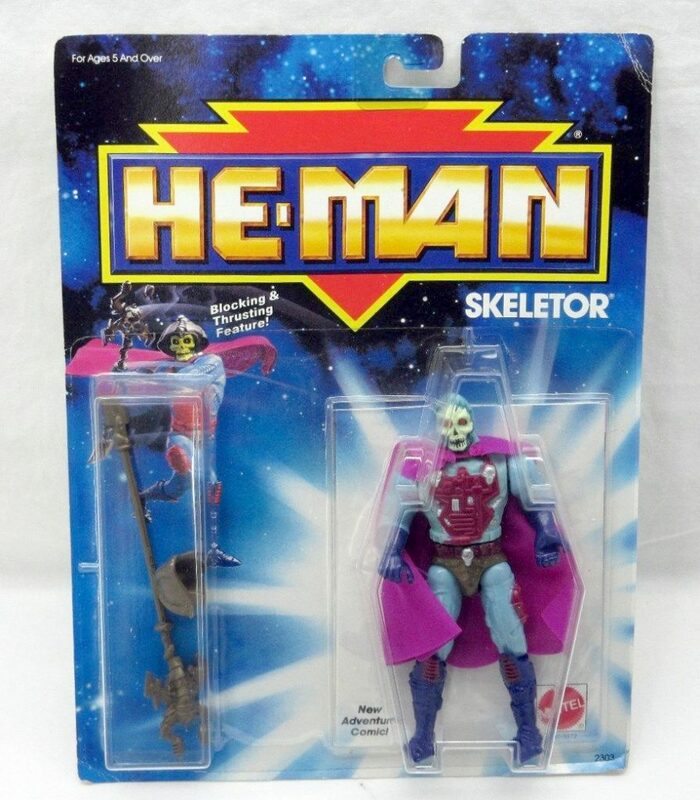 This is probably an odd place to start my foray into this series of toys, but I’ve been slightly obsessed with this figure since I first encountered it in a vintage toy shop a couple of years back. 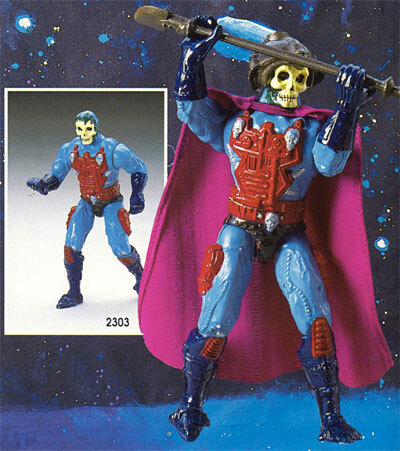 Part of it is I think there is something in the face that reminds me of Laser-Light Skeletor – another figure I’m obsessed with. 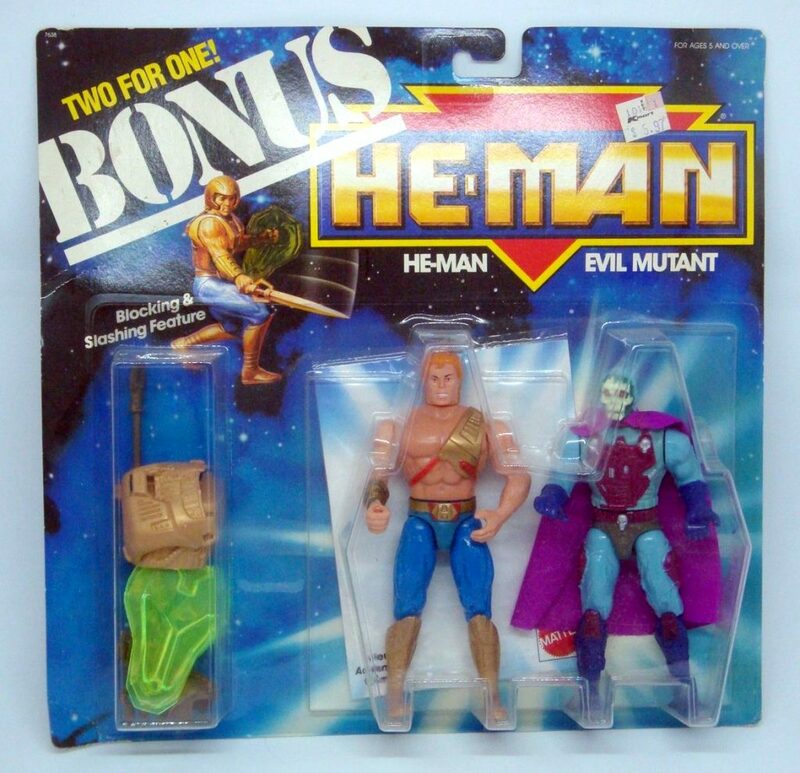 Because the figure came out at the tail end of the New Adventures line (actually simply called He-Man, but most fans call it New Adventures of He-Man after the associated cartoon), there isn’t any real media or stories to go along with him, at least that I’ve been able to find. 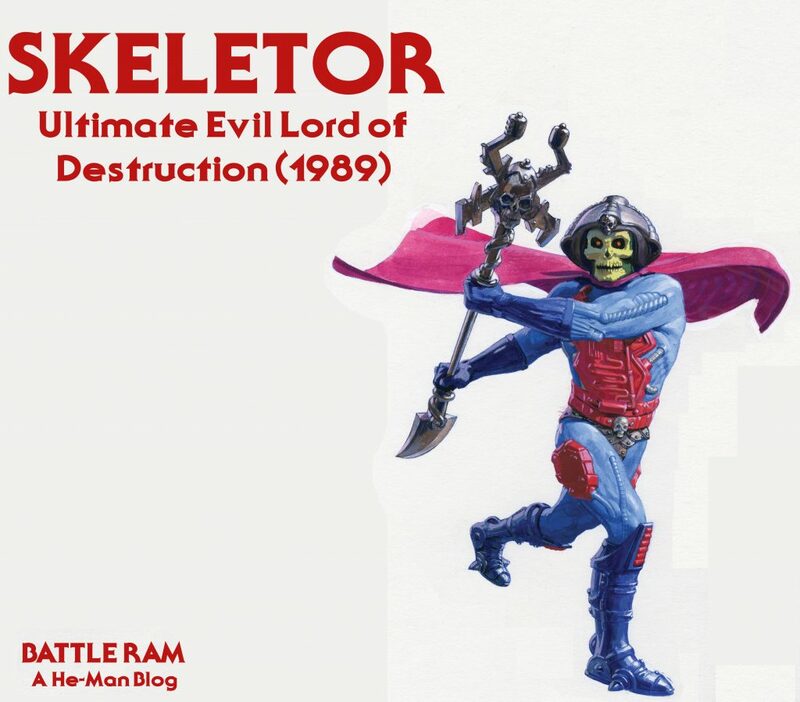 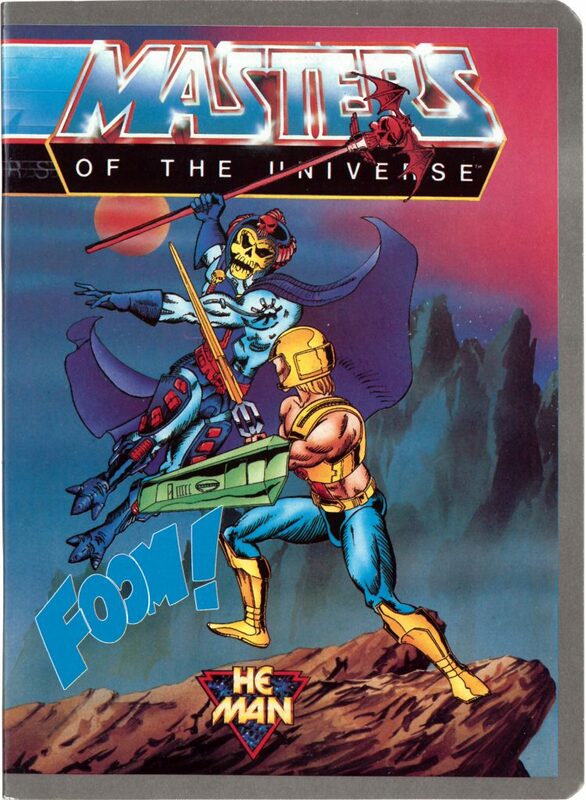 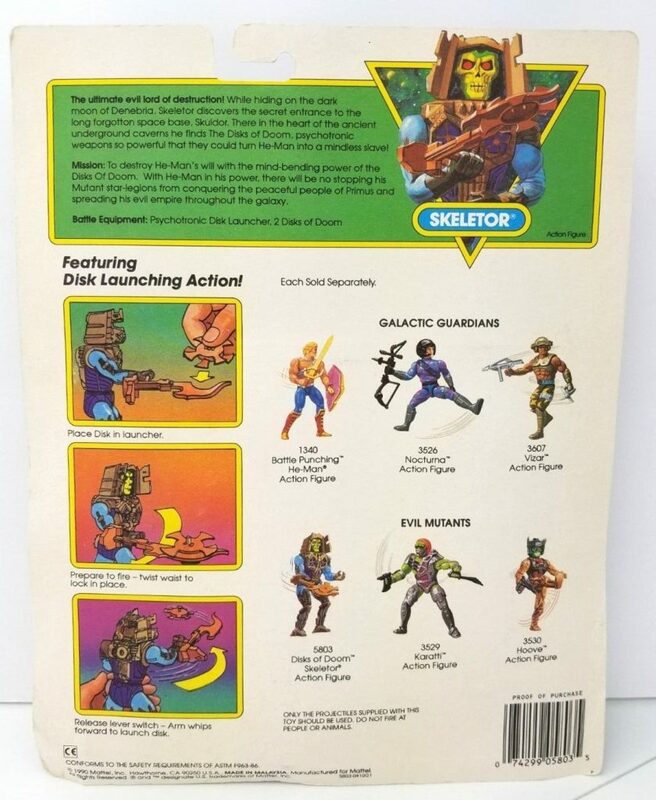 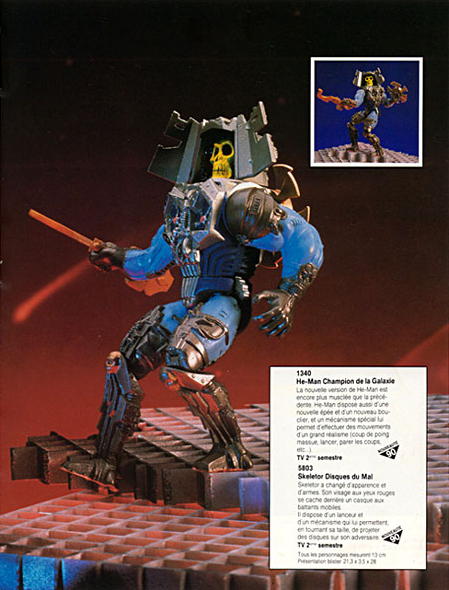 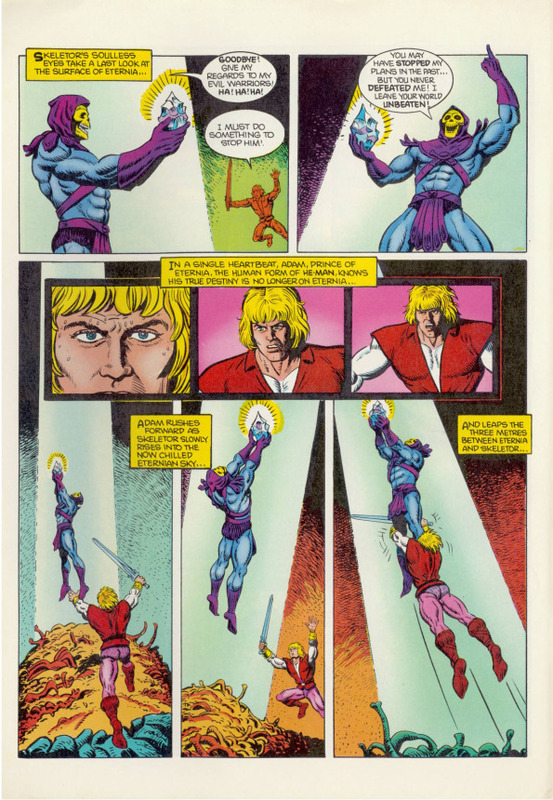 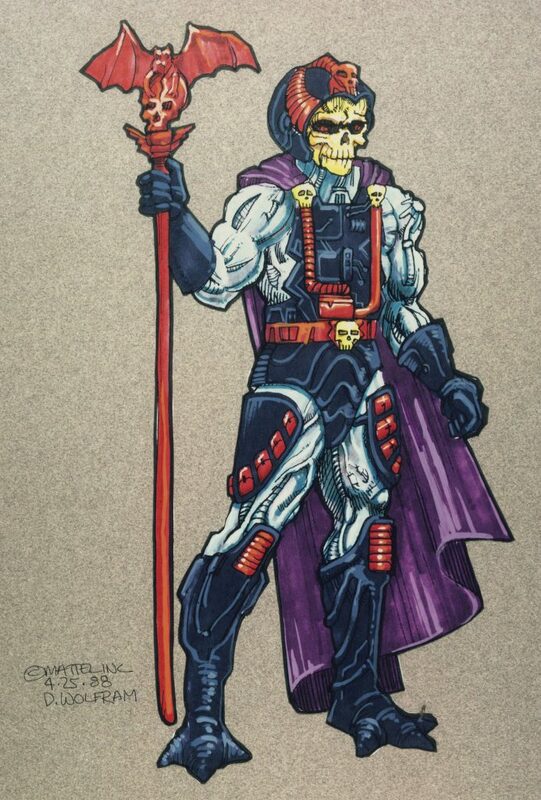 Like Laser-Light Skeletor and the other New Adventures versions of Skeletor, Battle Blade Skeletor was designed by David Wolfram. 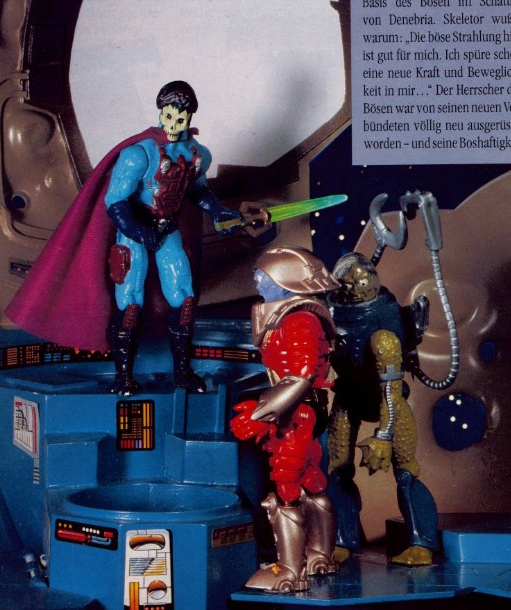 He bears all the hallmarks of Wolfram’s style, including the narrow lower face, tech-infused body and suit, and generally creepy, asperous design language. 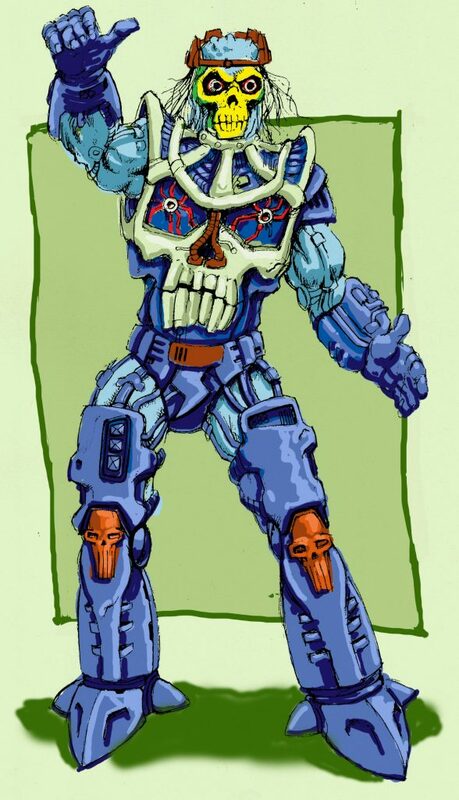 This early sketch of the figure by David Wolfram (digitally colored long after it was drawn) shows a nearly finalized design. 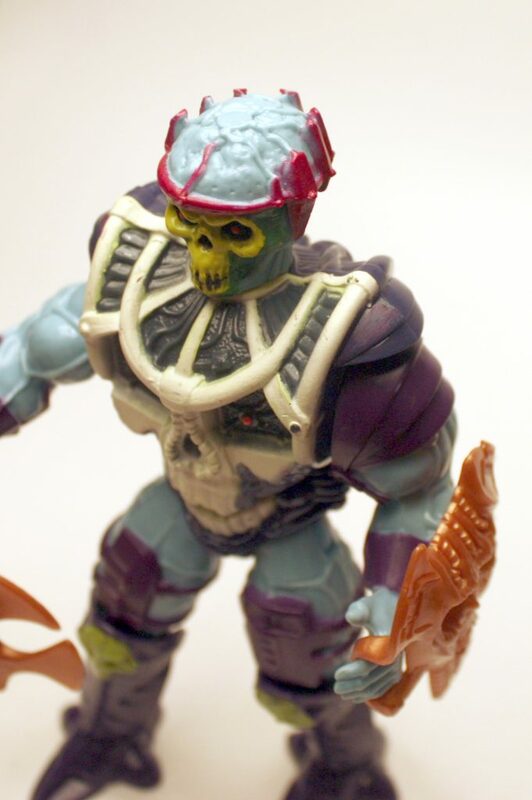 The bottom jaw on the skull costume is located a bit higher, but otherwise this is very close to how the action figure looked in production. 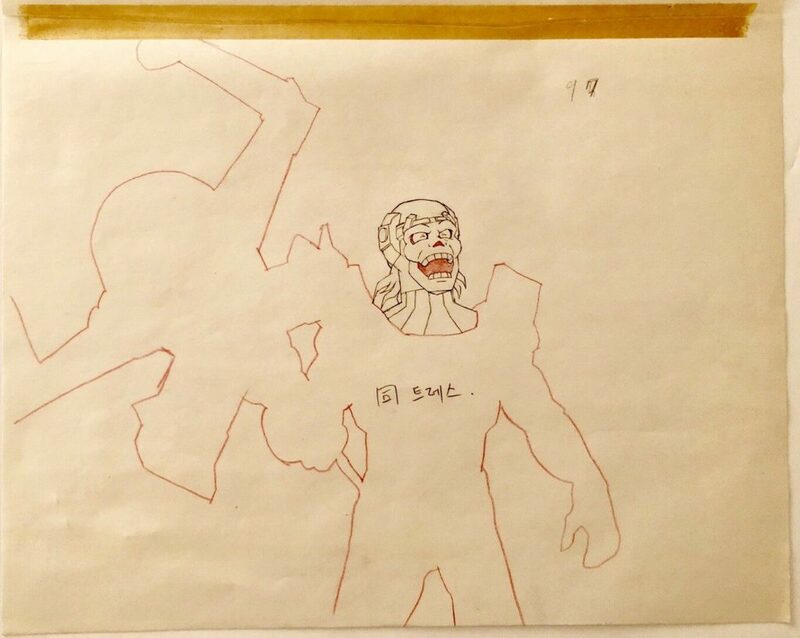 Notice the scraggly hair on the drawing. 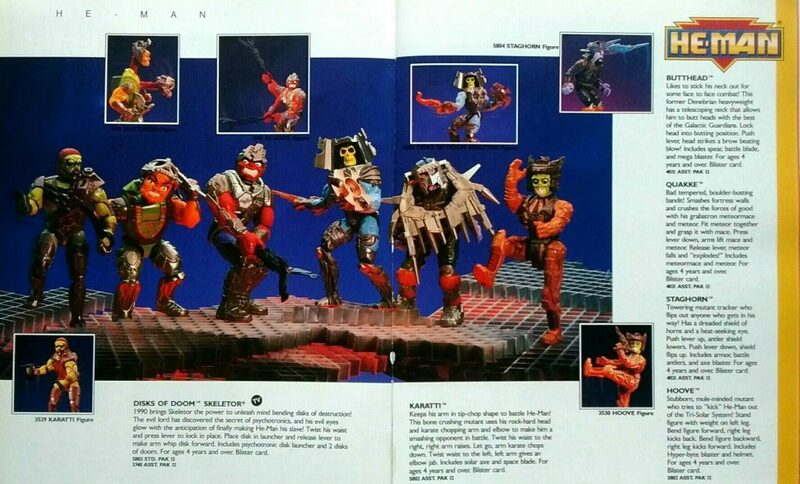 That shows up on hand-painted prototypes, but on the production figure it was straight. 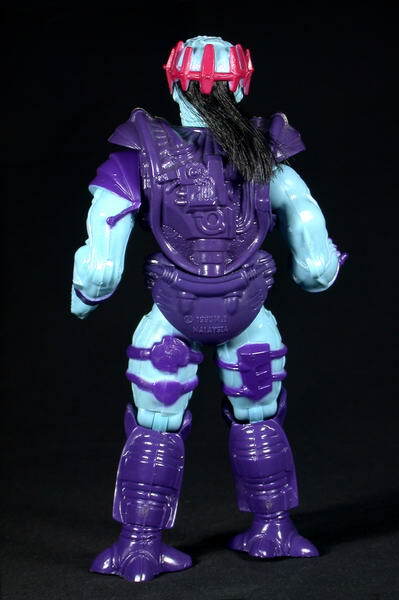 The hair on BB was supposed to be a lot gnarlier, but we had to work with someone from the Barbie group, who couldn’t give me what I was looking for- they only did pretty. 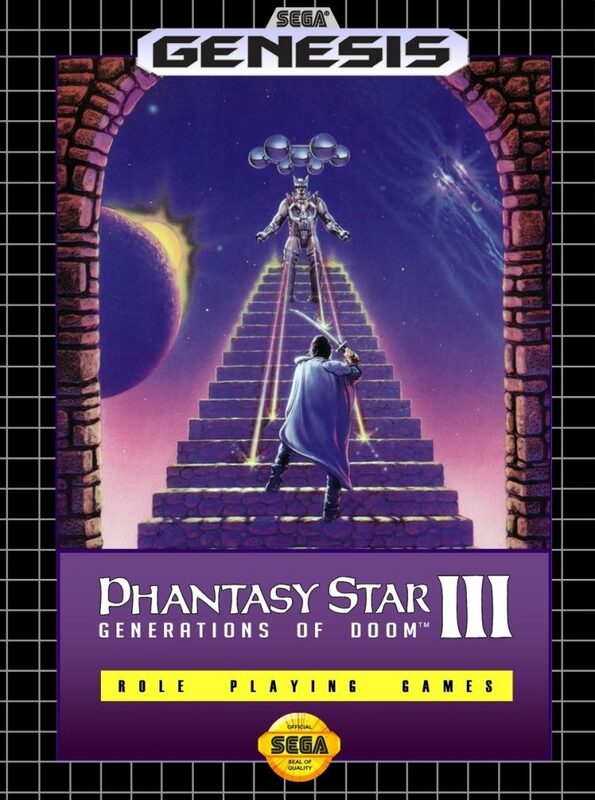 Curiously, a similar design is present in the principle villain (illustrated version) in Phantasy Star III: Generations of Doom (thanks to Stradlemonkey for pointing this out). 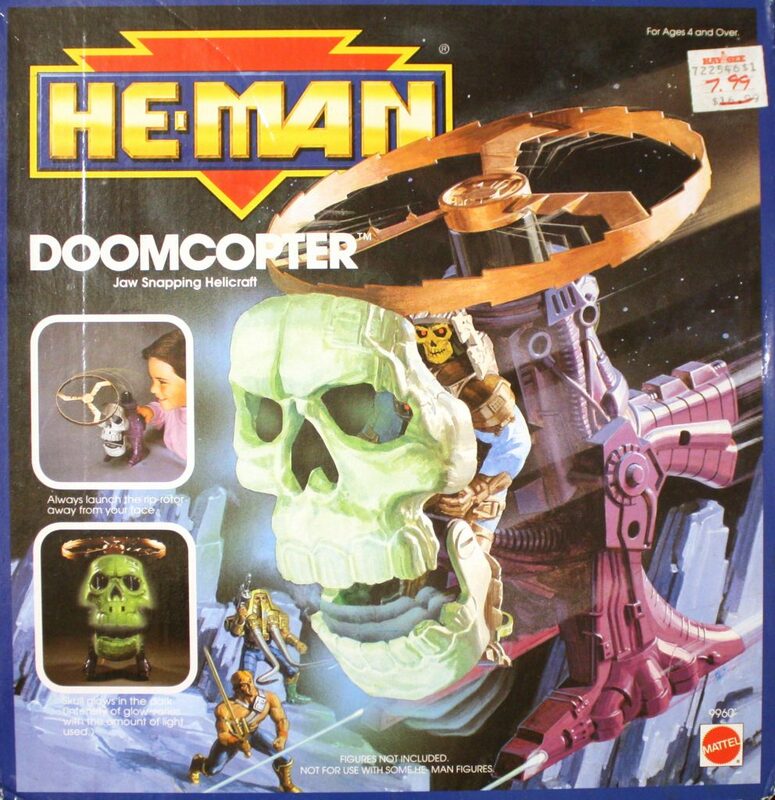 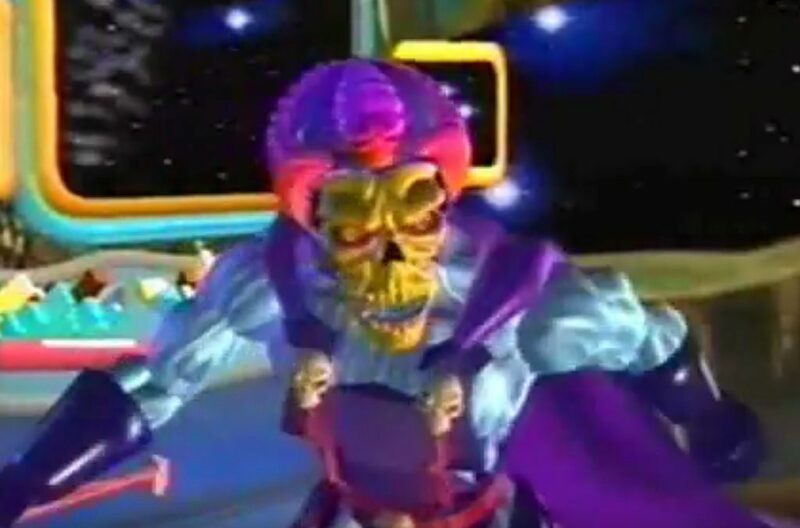 The game was released in 1990, the same year as Disks of Doom Skeletor. 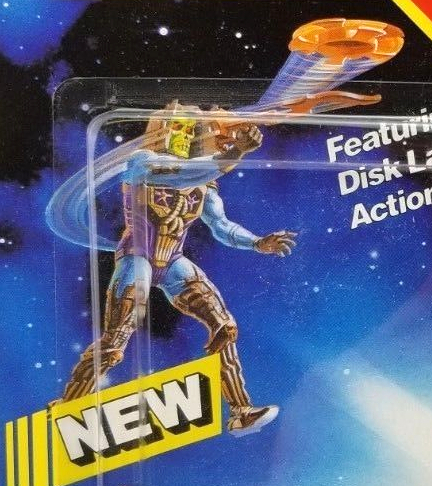 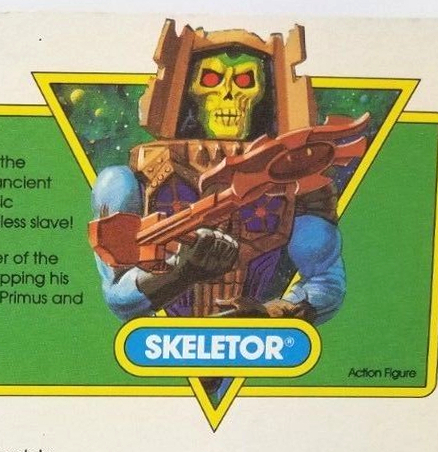 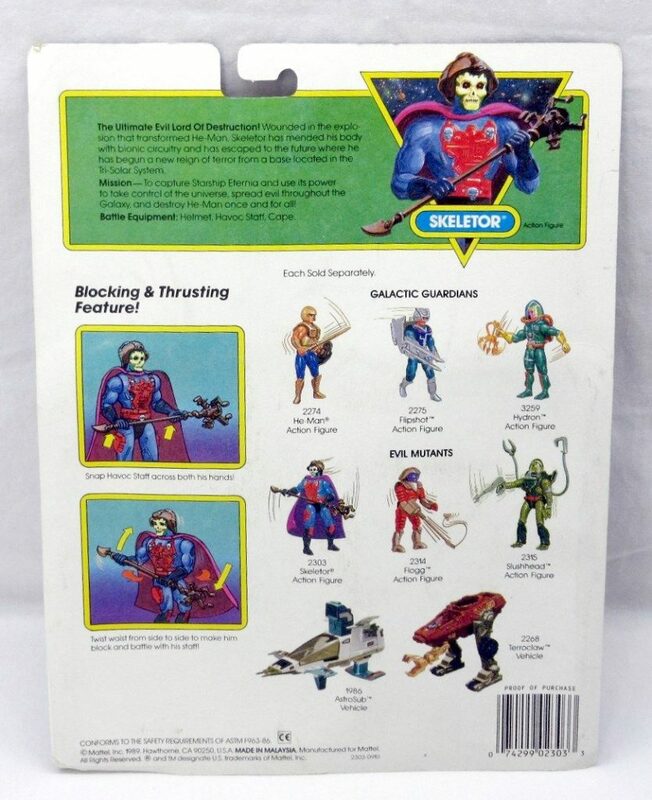 Disks of Doom Skeletor’s trademark was filed on November 16, 1989, so I would guess Mattel’s design came first. 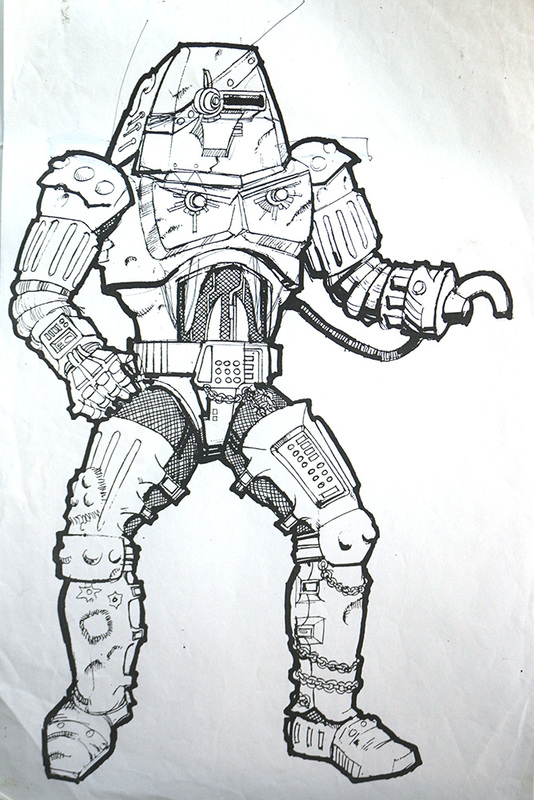 We might also see some early iteration of the concept in the artwork below by Errol McCarthy. 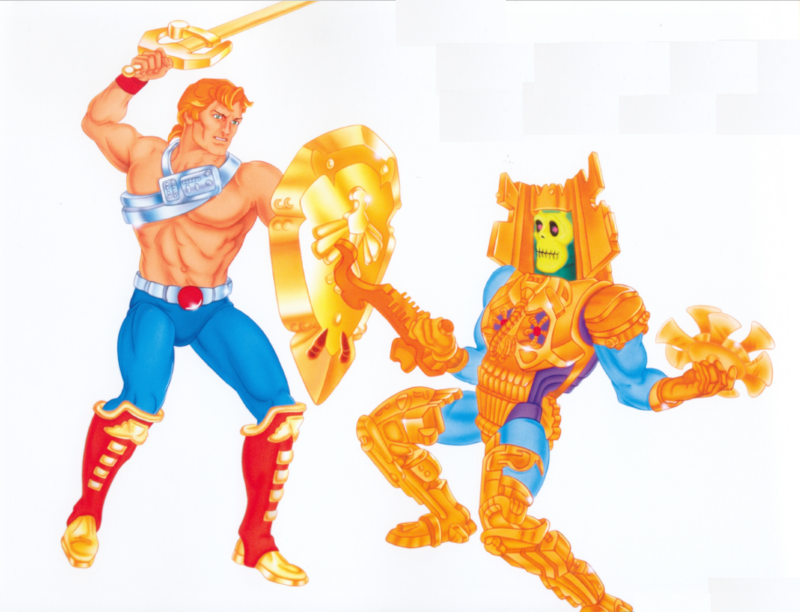 Errol says he just did illustrations for New Adventures of He-Man, and was never a designer of the characters. 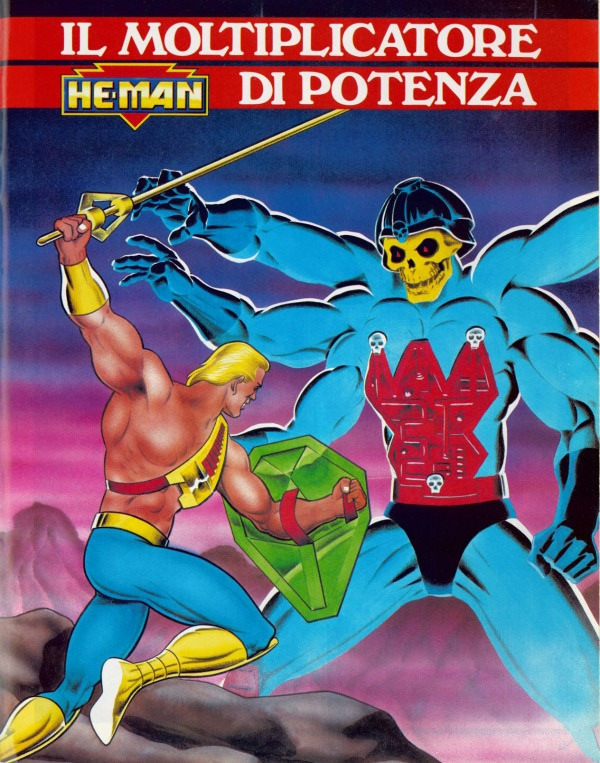 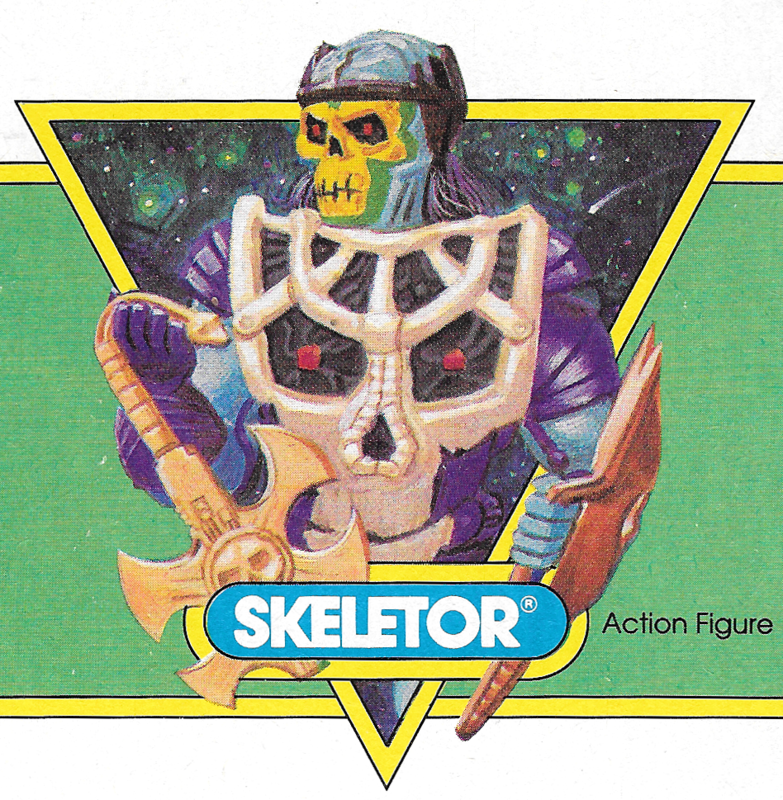 In the art below, we see the skull motif again in Skeletor’s costume. 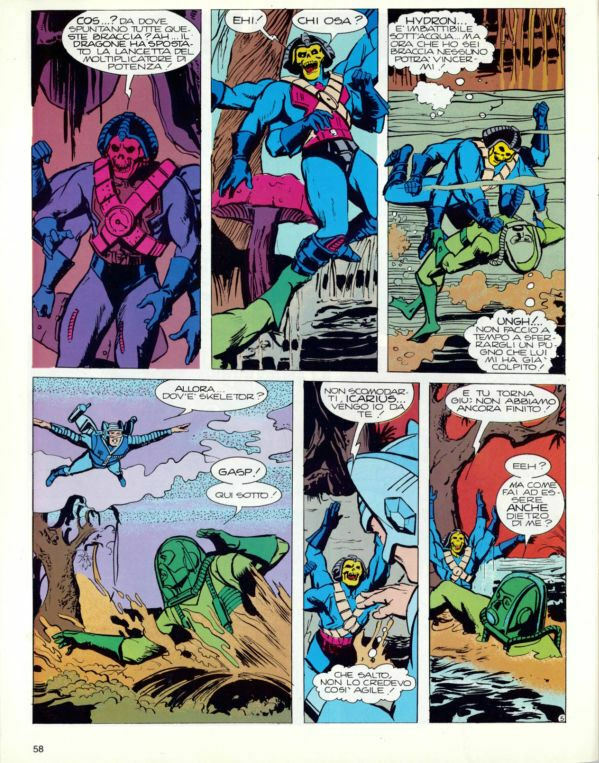 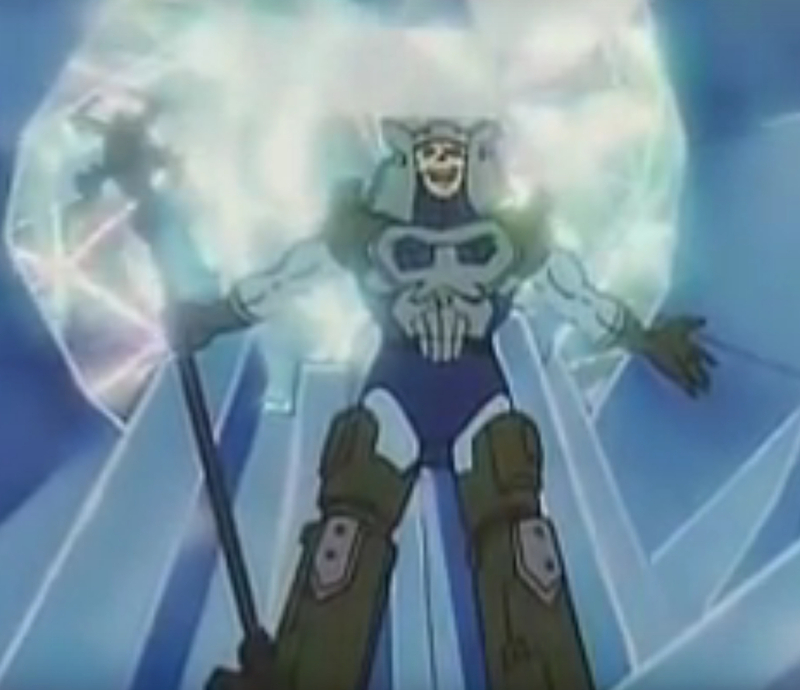 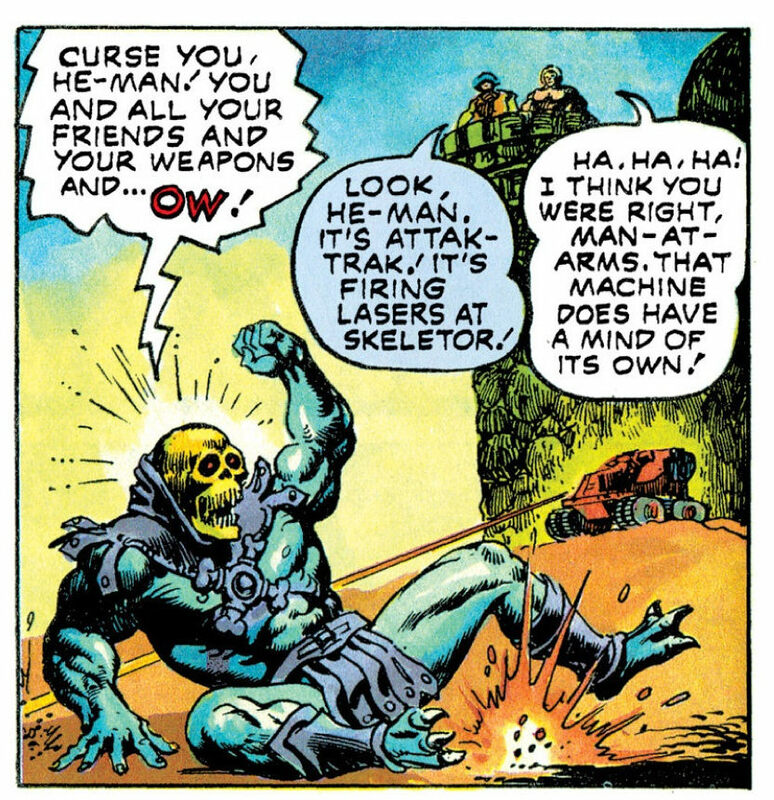 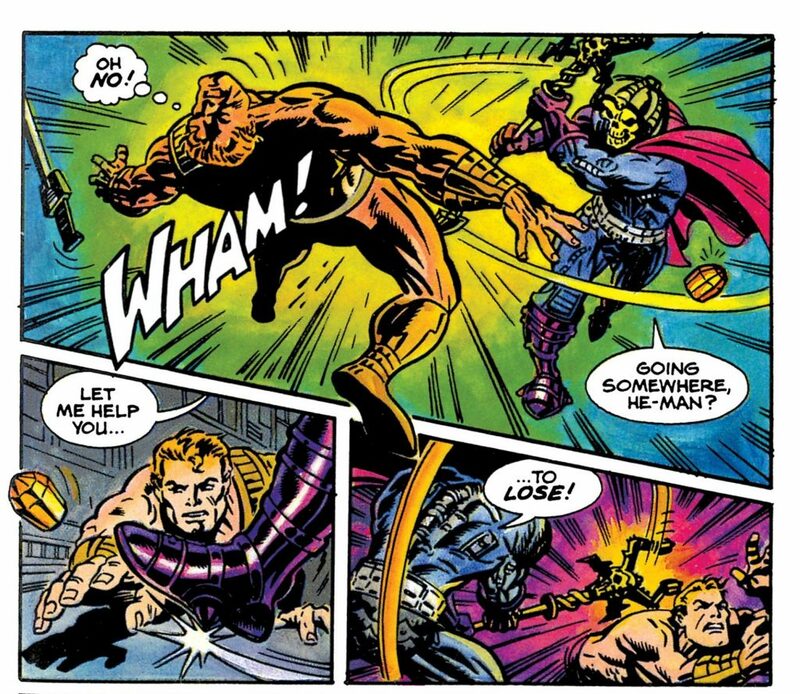 In this instance Skeletor has a fully-robotic body. 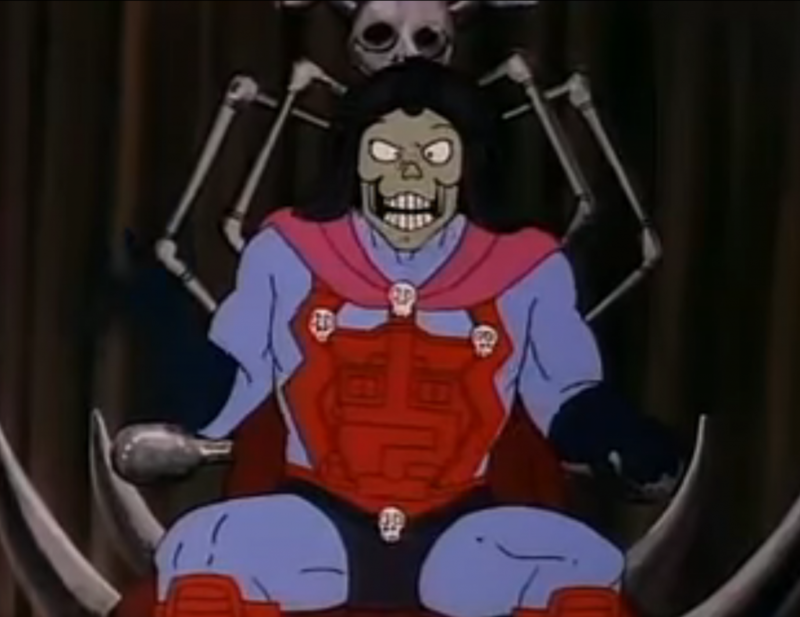 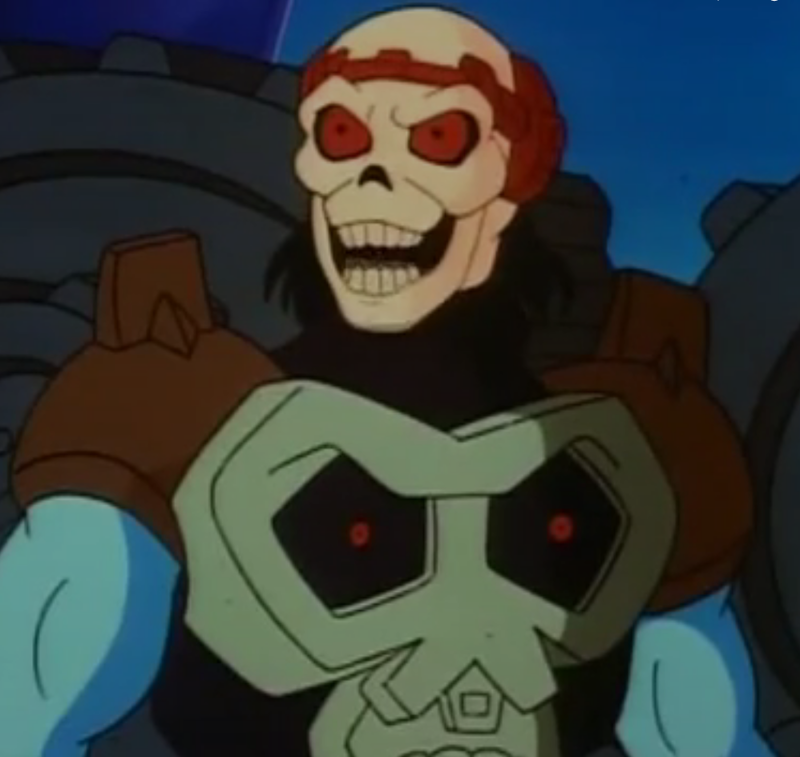 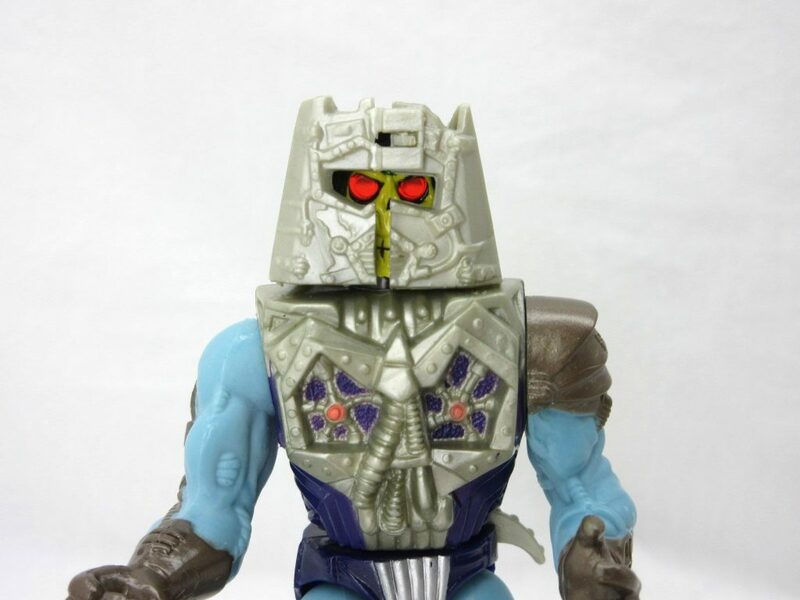 Interestingly he also has hair – a trait he shares with Battle Blade Skeletor. 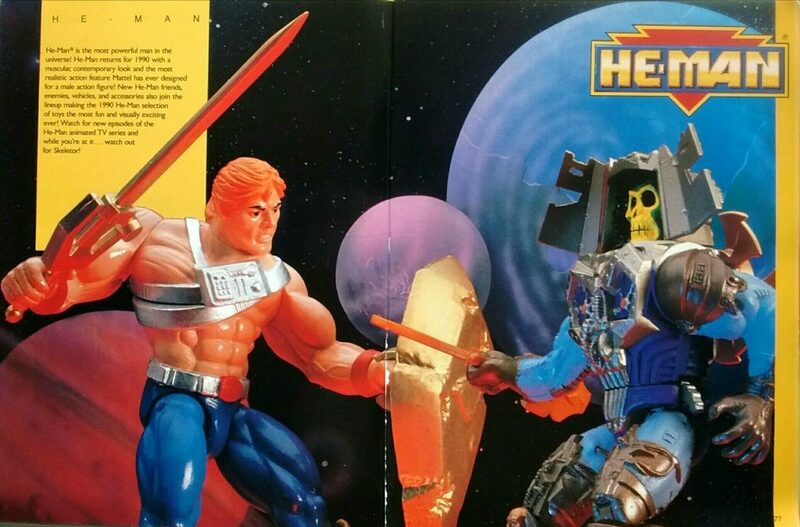 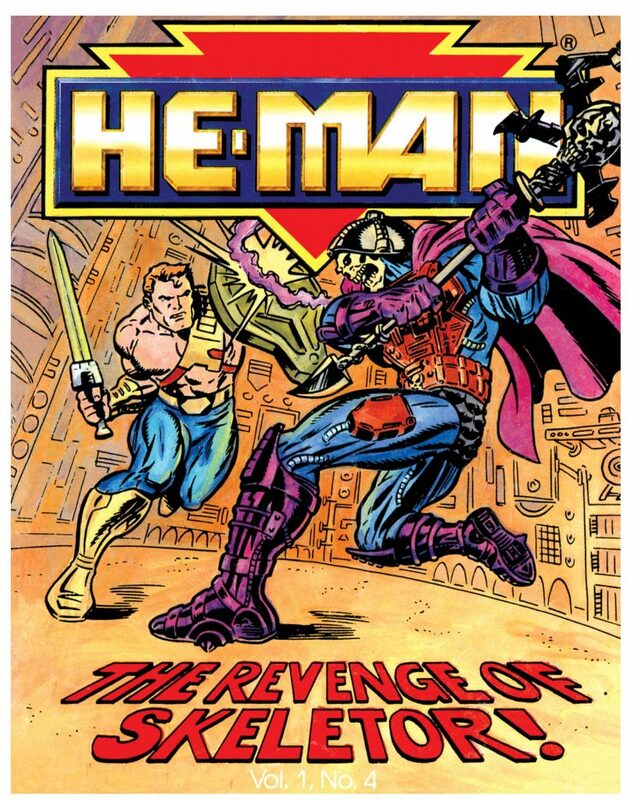 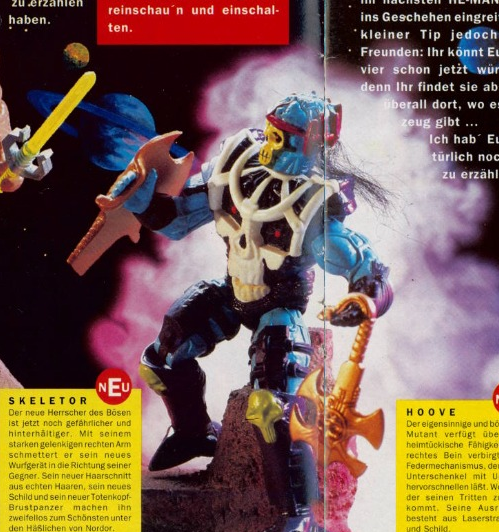 We get a look at a hand-painted final prototype version of the figure in the 1991 German He-Man magazine below. 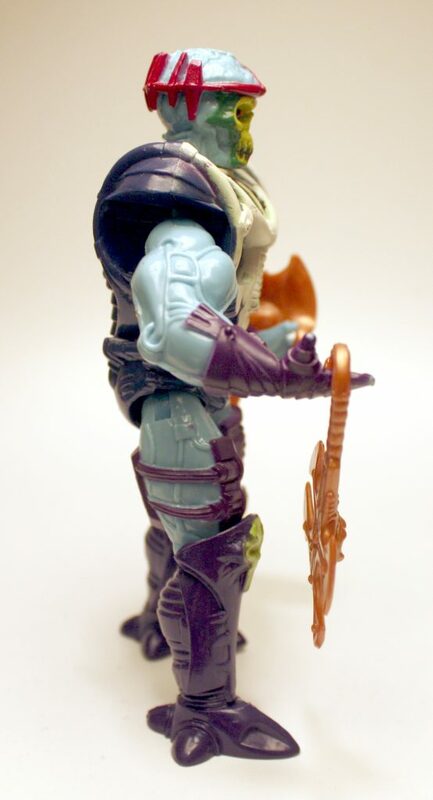 This version has crisper paint as well head articulation – the final figure has a static head. 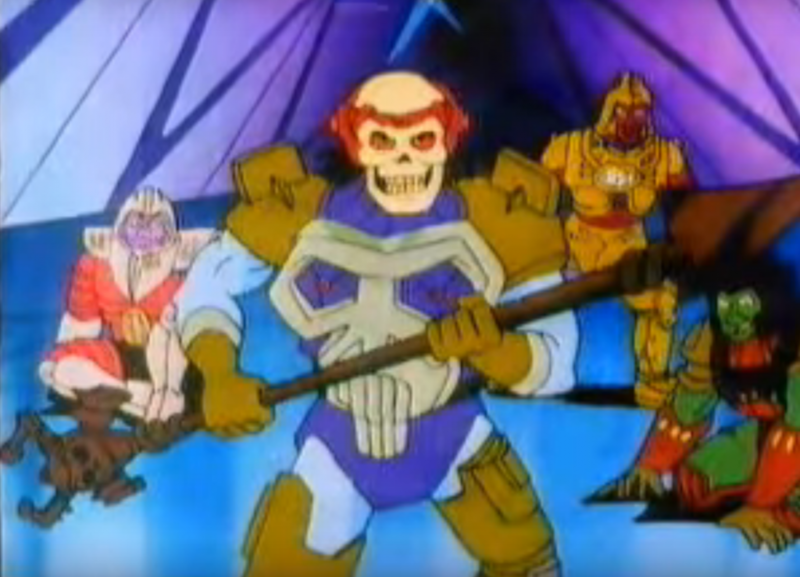 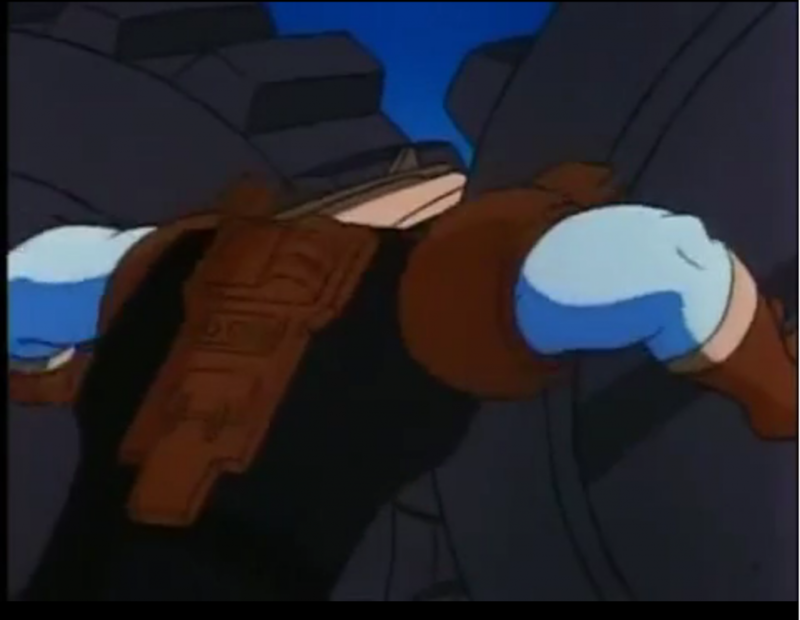 We also see an early version of Thunder Punch He-Man (the 1992 version). 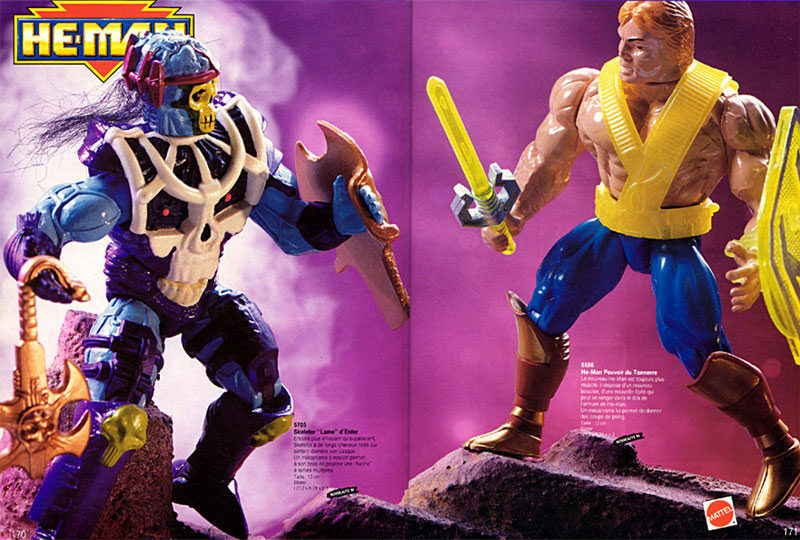 Both figures are quite a bit bulkier-looking than the 1989 versions of He-Man and Skeletor. 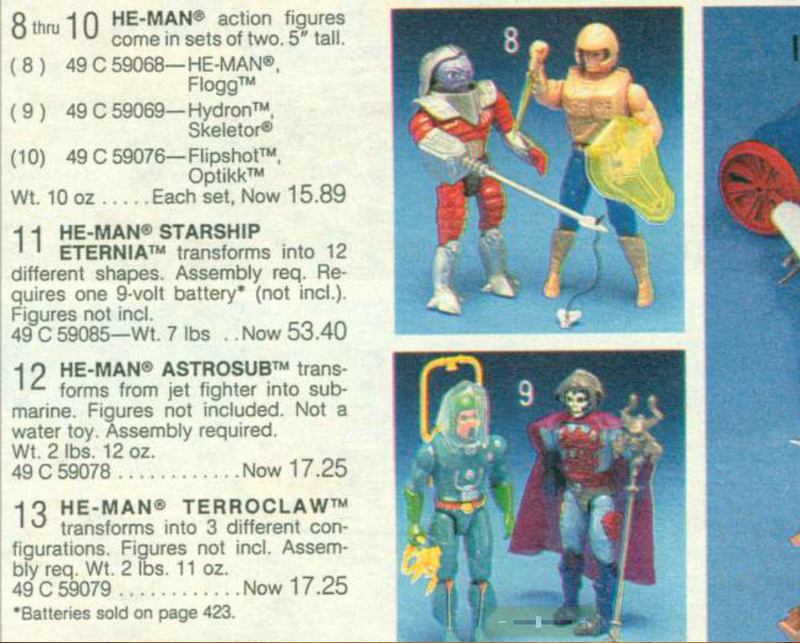 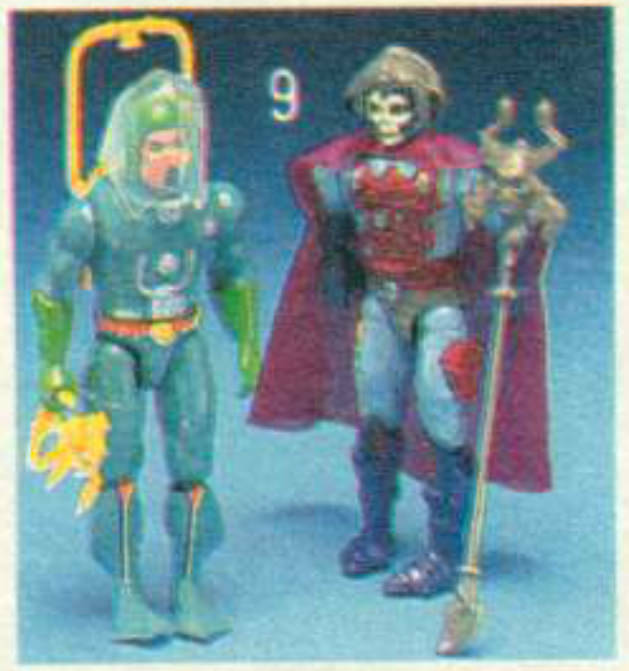 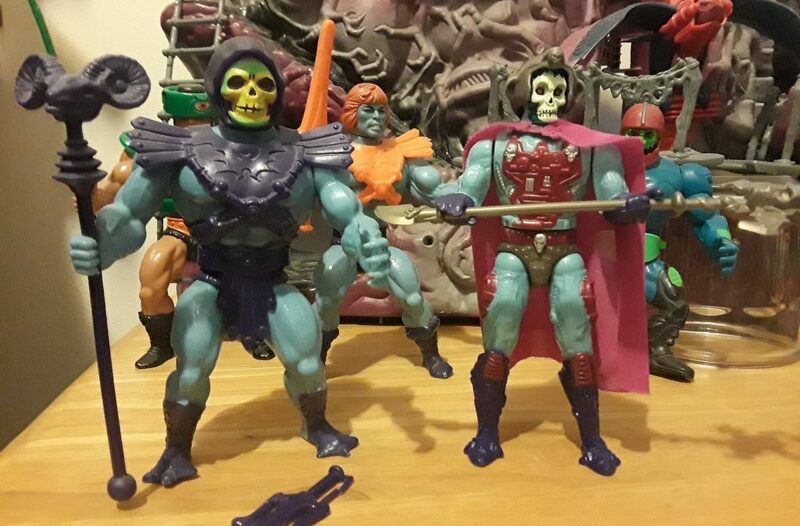 I think Mattel was trying to capture a little of the chunkiness and heavily-muscled appearance of the original 1982 He-Man and Skeletor figures here. 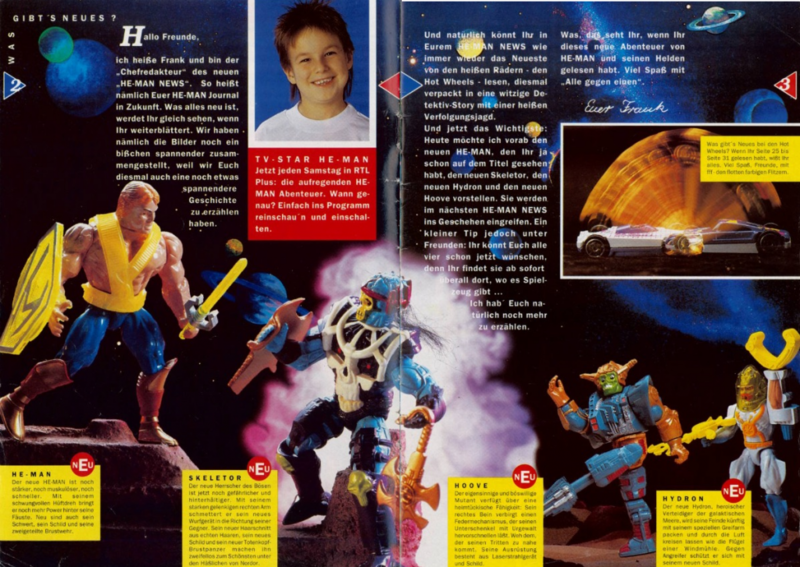 1991 French catalog, with image flipped the right way around. 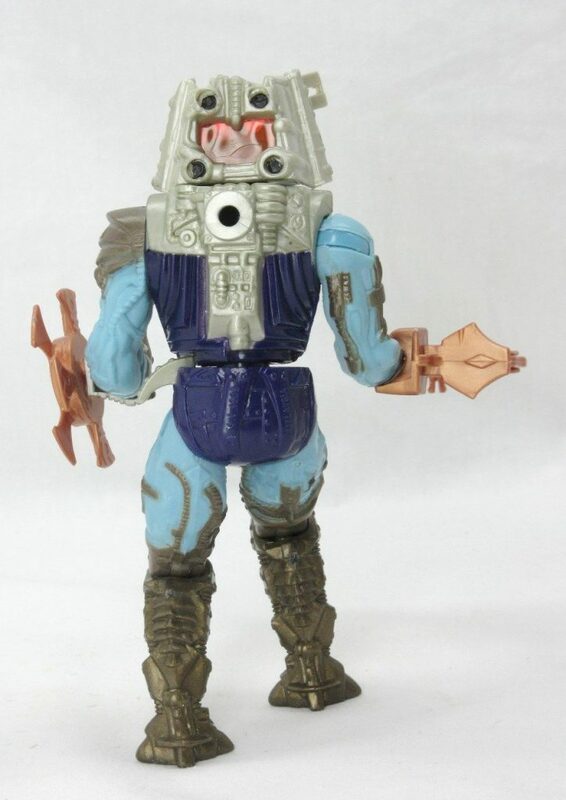 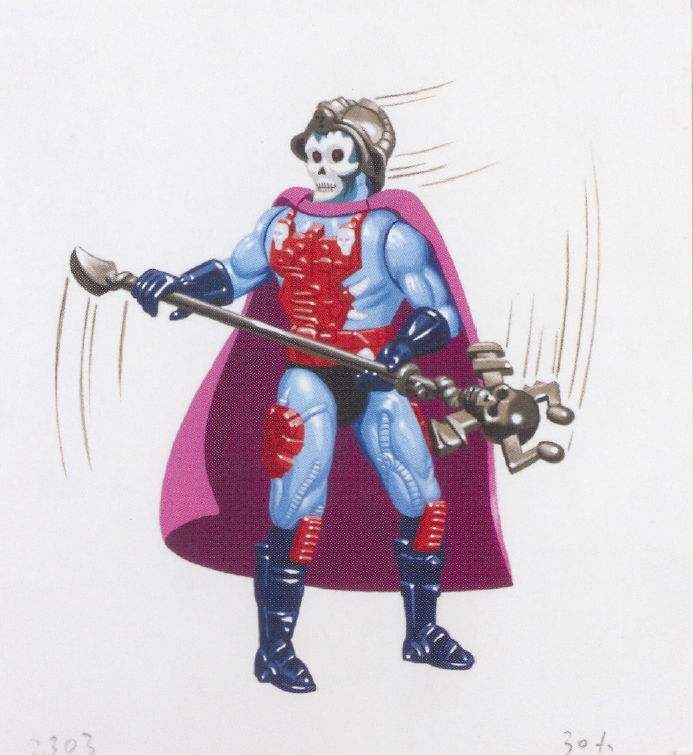 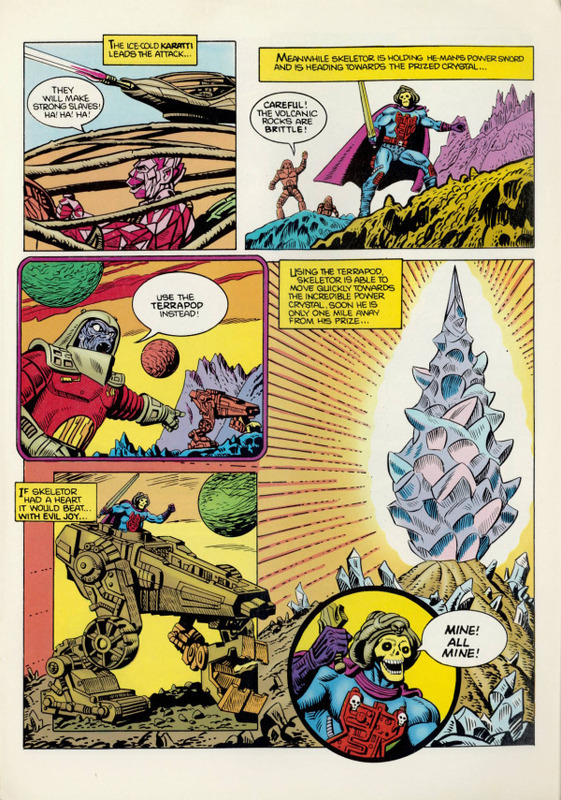 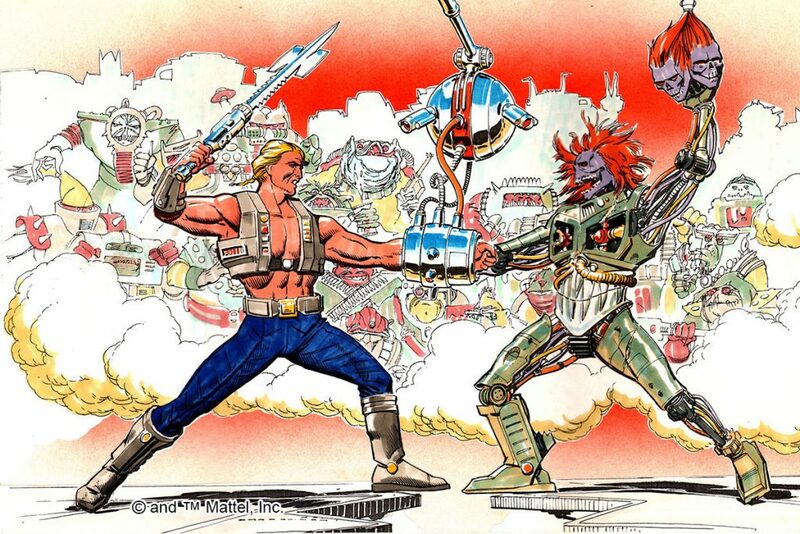 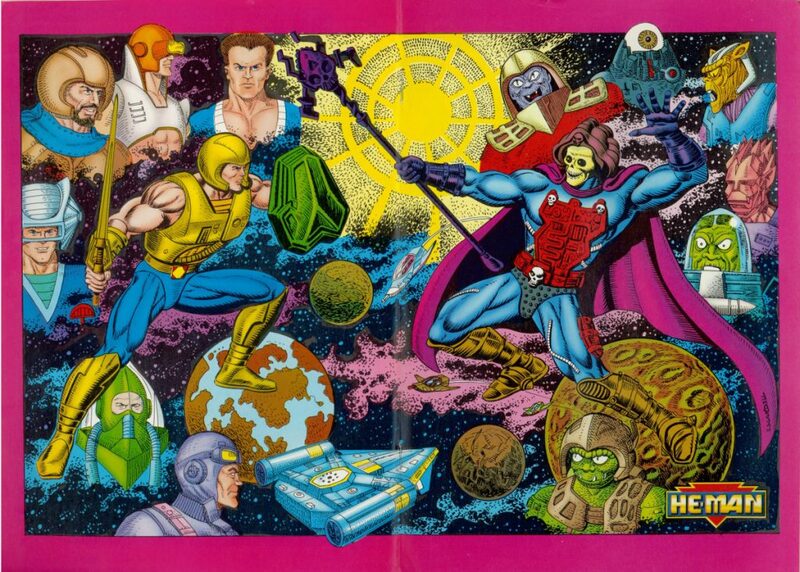 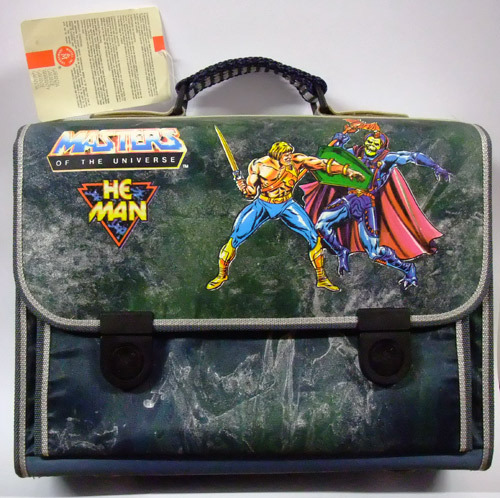 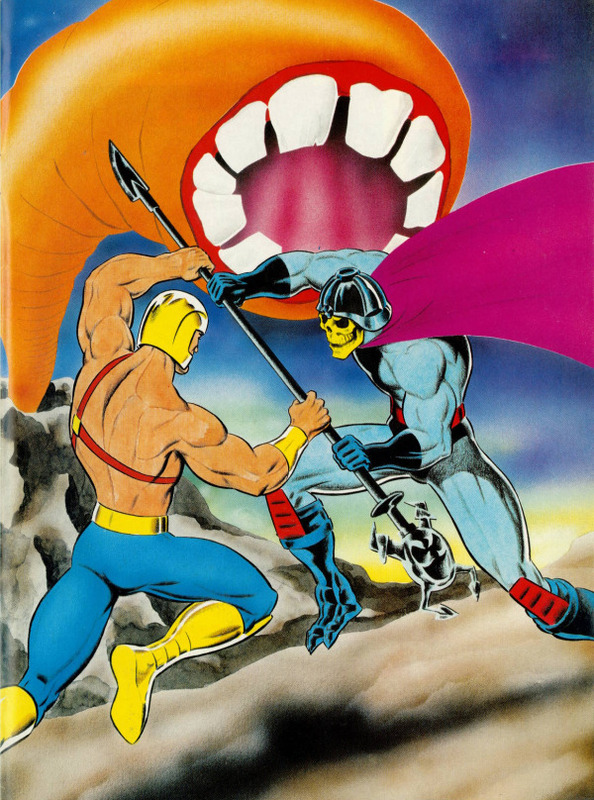 Image source: Grayskull Museum. 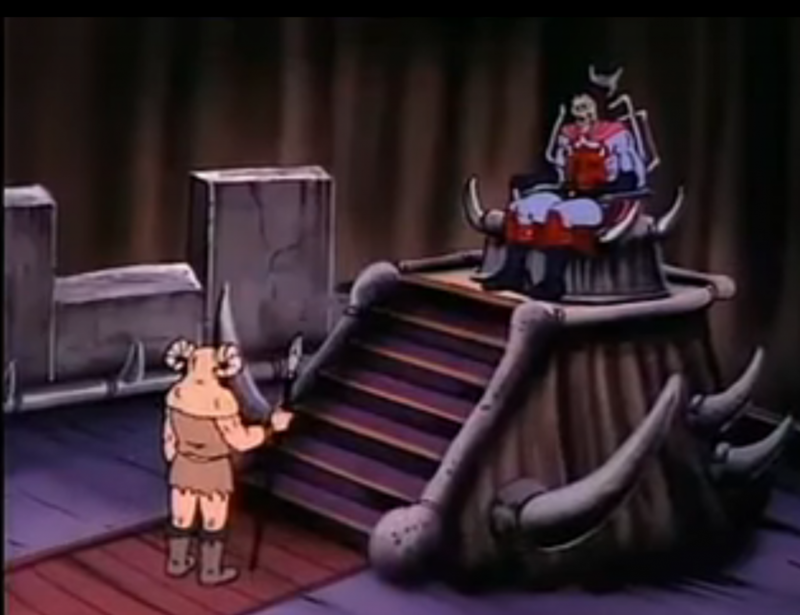 The new ruler is now even more dangerous and ambitious. 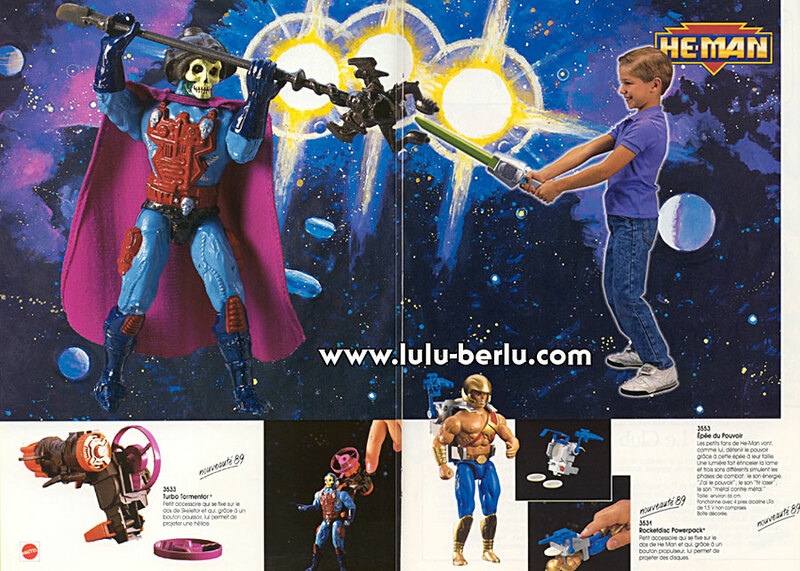 With his strong articulated right arm he smashes his new throwing machine in the direction of his opponents. 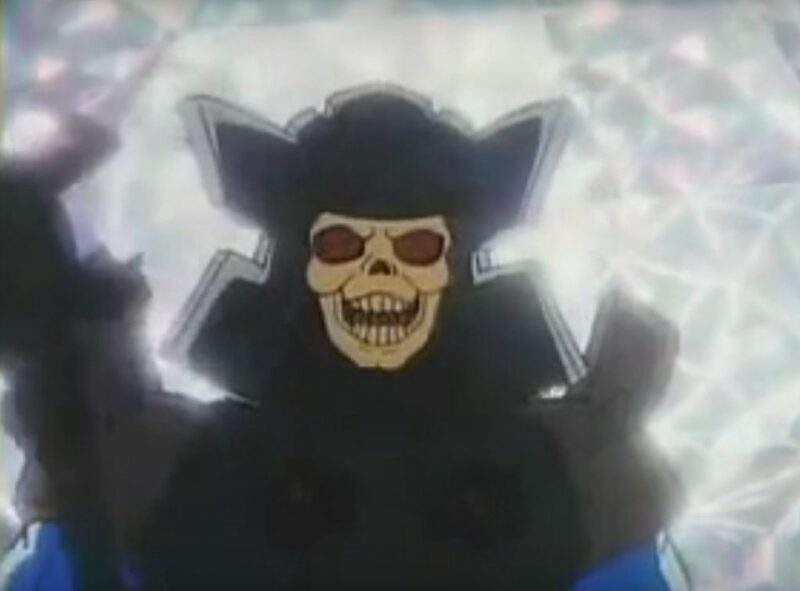 His new haircut of real hair, his new shield and his new skull and crossbones make him undoubtedly the most beautiful among the Nordor. 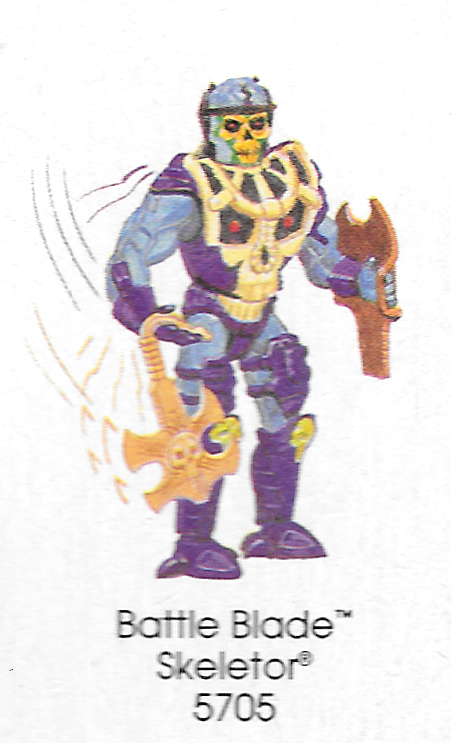 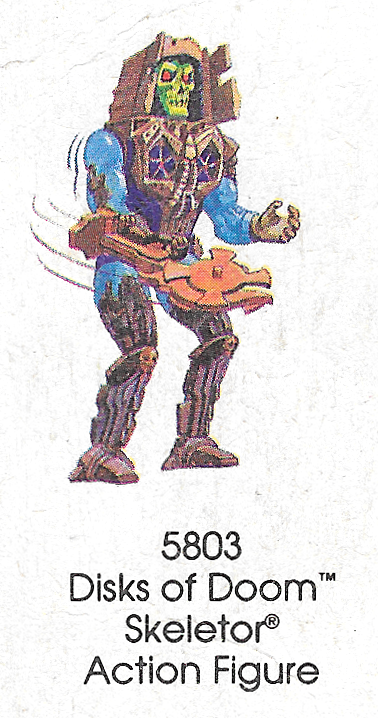 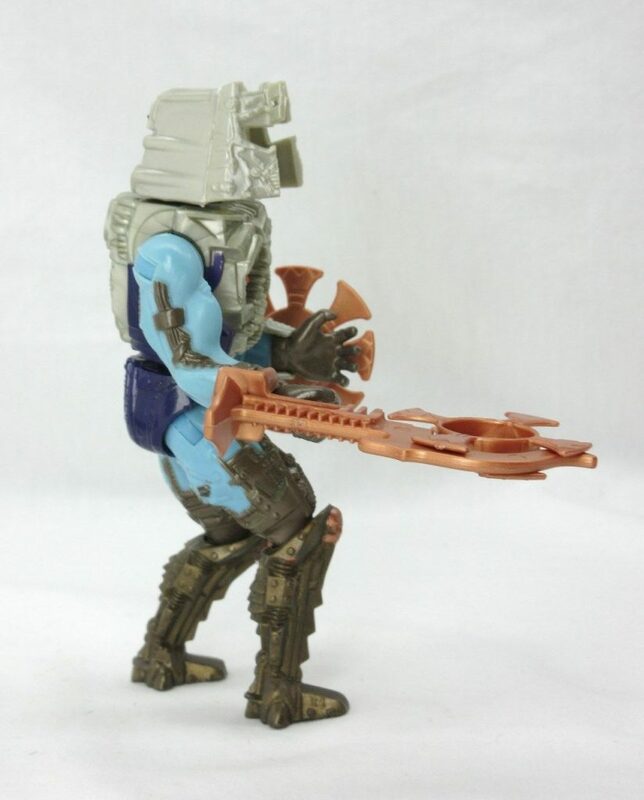 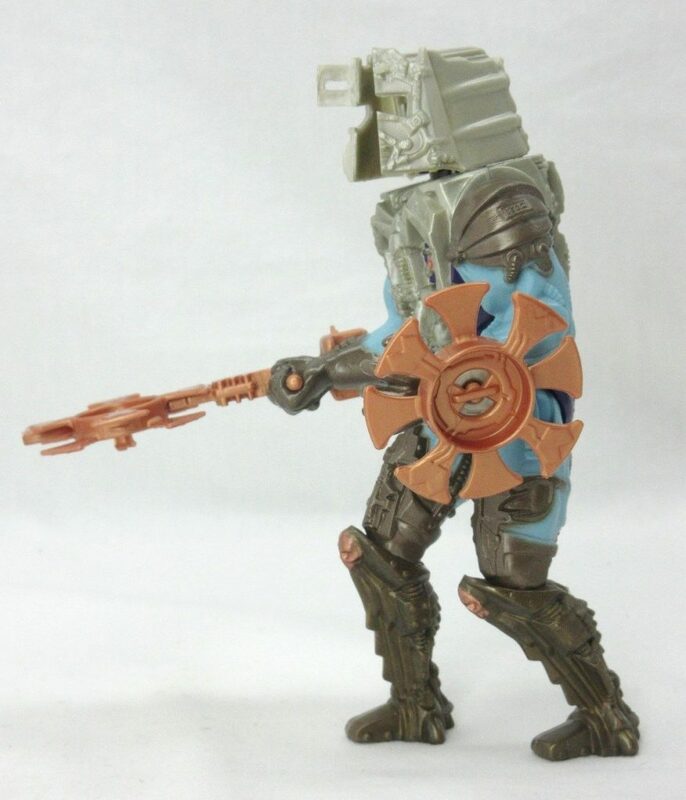 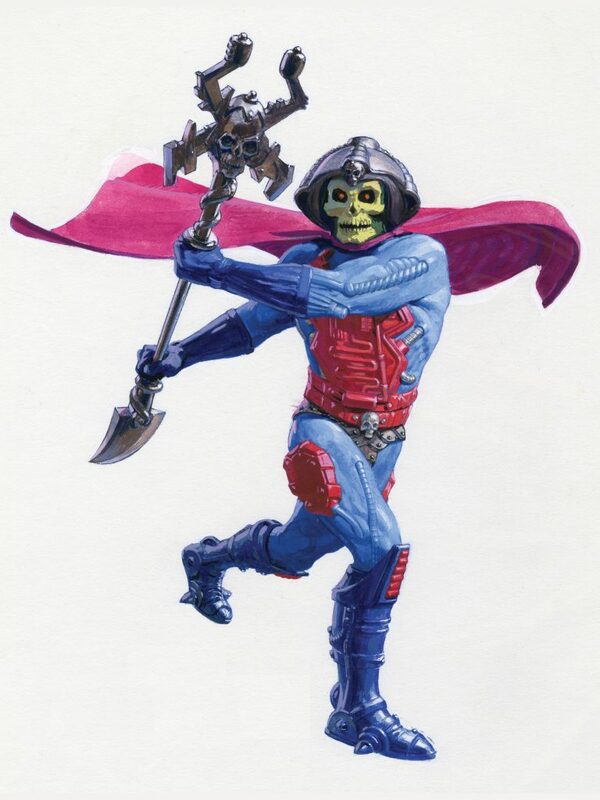 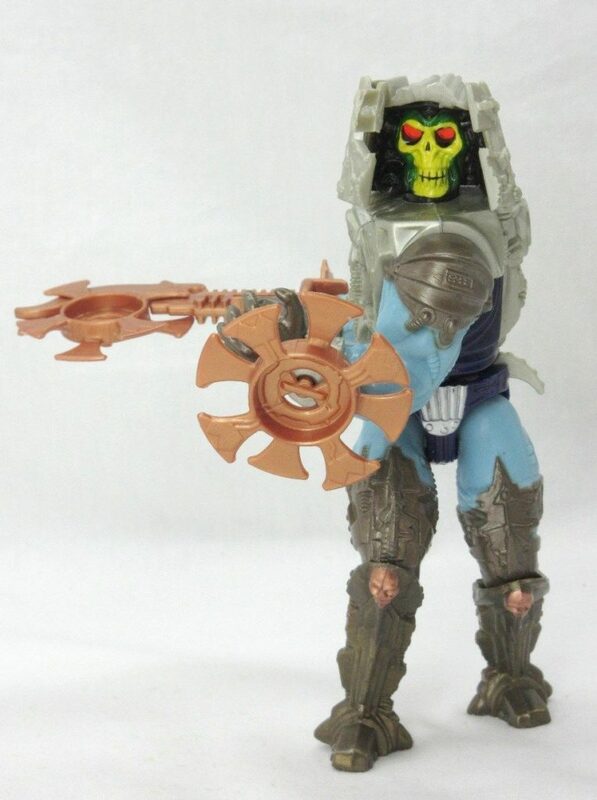 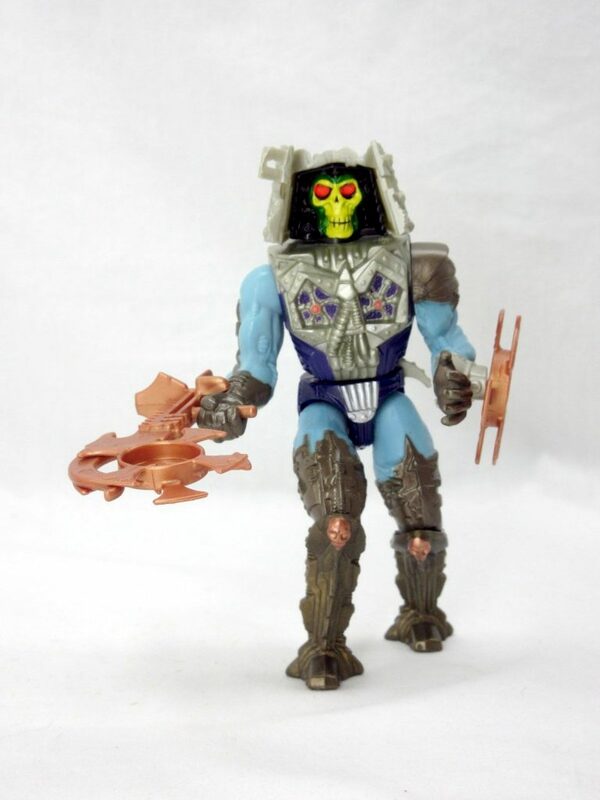 Battle Blade Skeletor has a spring-loaded, ball-jointed right arm that allows him to toss his “quadro-blade” weapon. 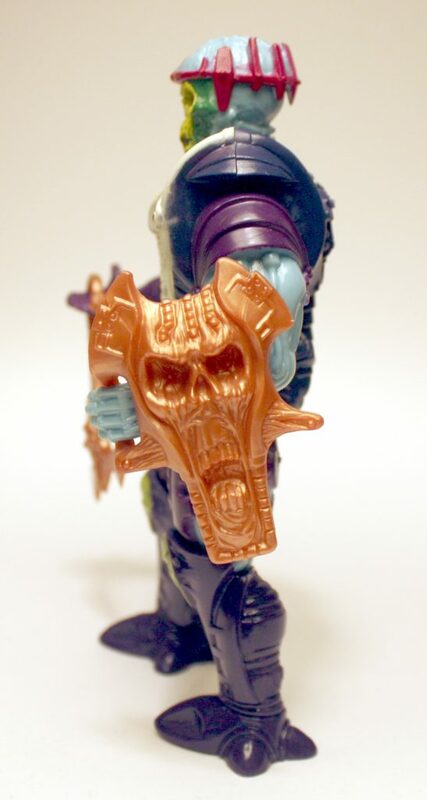 He also comes with a shield that continues with the creepy skull motif. 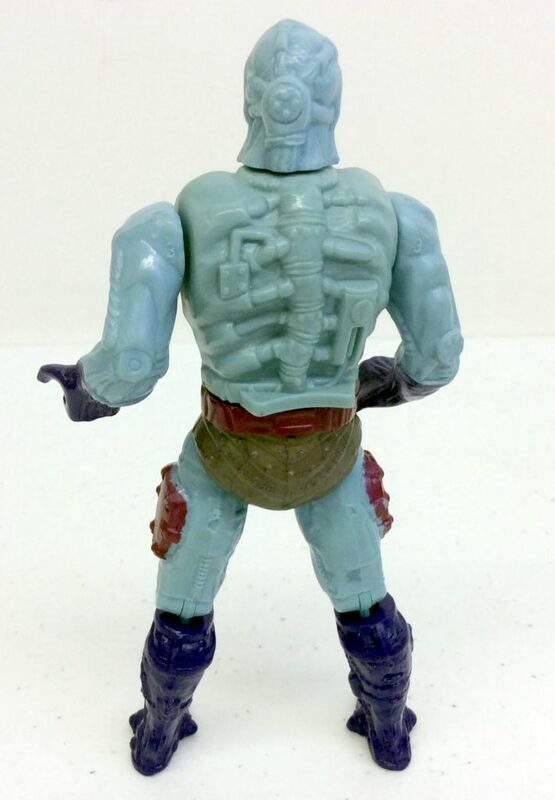 The white paint on his torso glows in the dark. 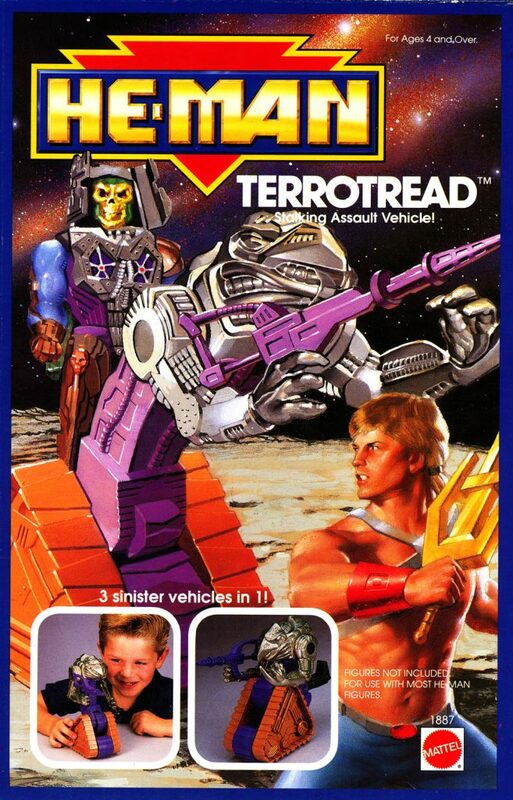 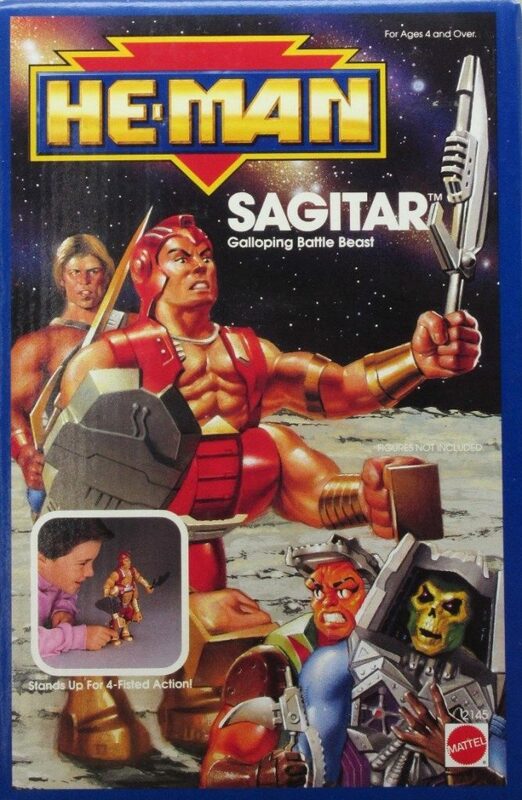 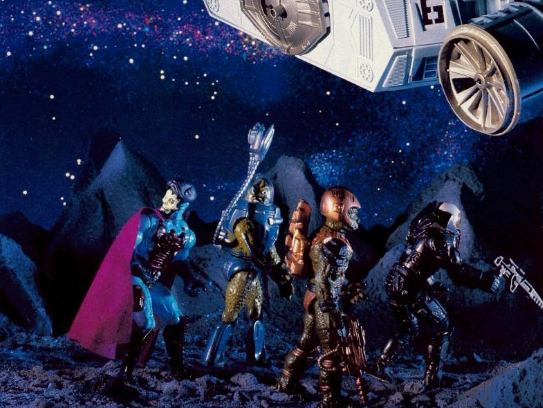 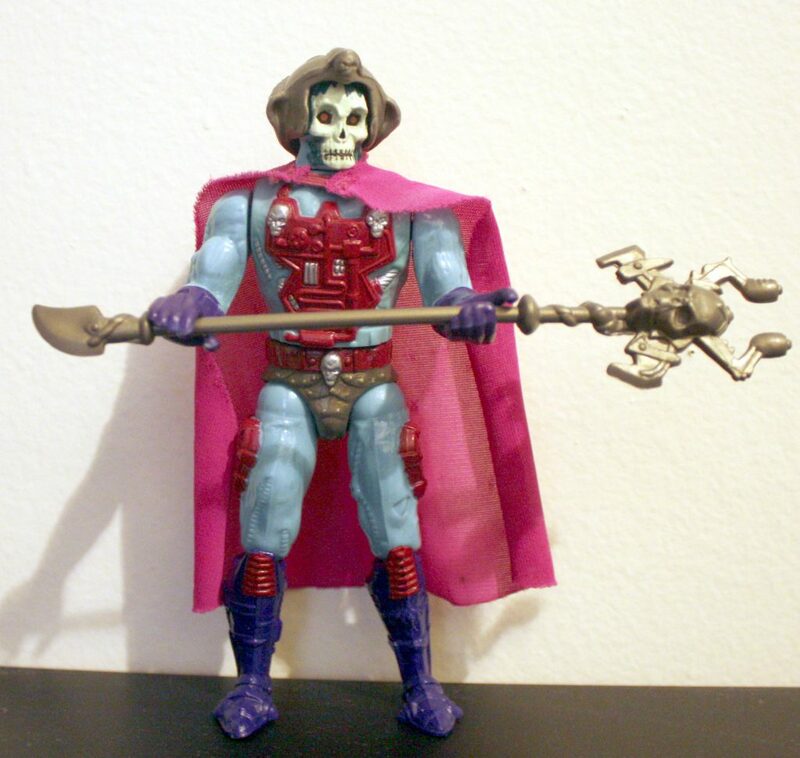 Unlike the 1989 Skeletor, this version is almost in scale with the original 1982 MOTU line. 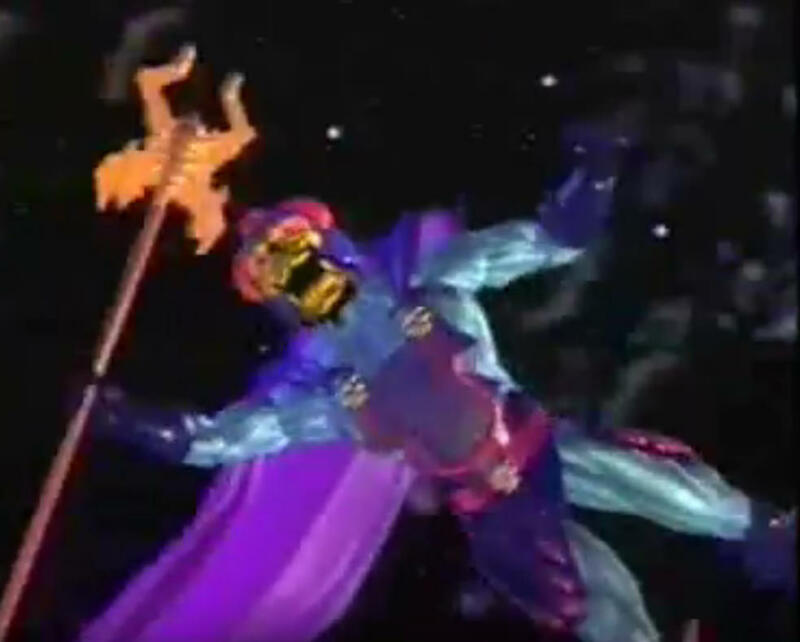 He stands at about the same height, although of course that’s while standing up straight – something most of the original figures couldn’t do. 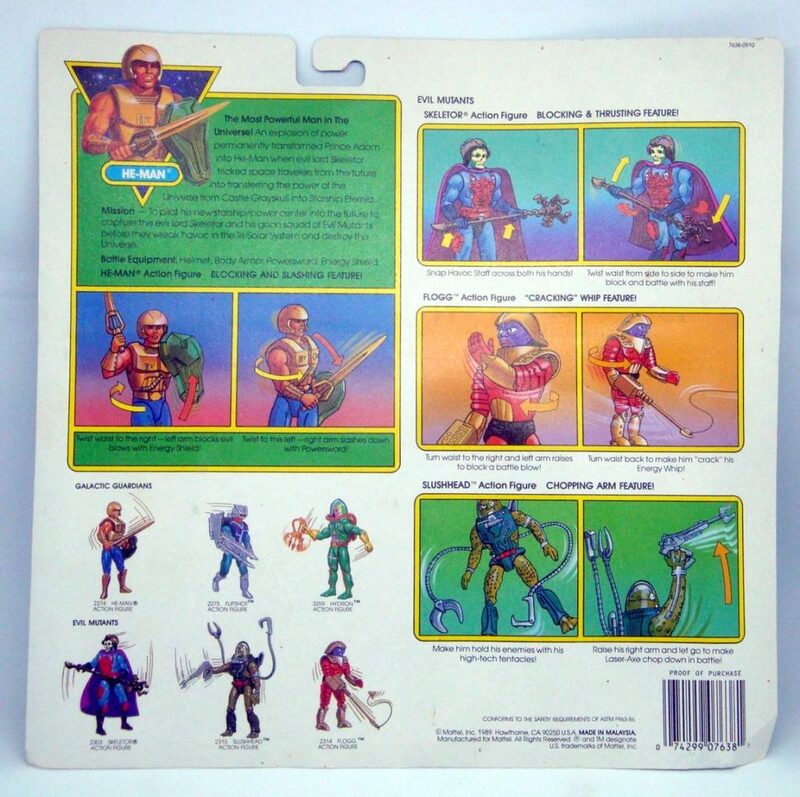 William George painted the artwork on the front of the figure’s packaging, but I don’t know who was responsible for the illustrations on the back. 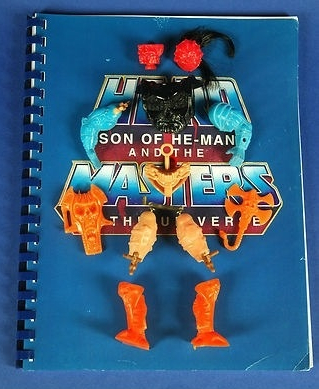 The Evil MASTER OF THE UNIVERSE! 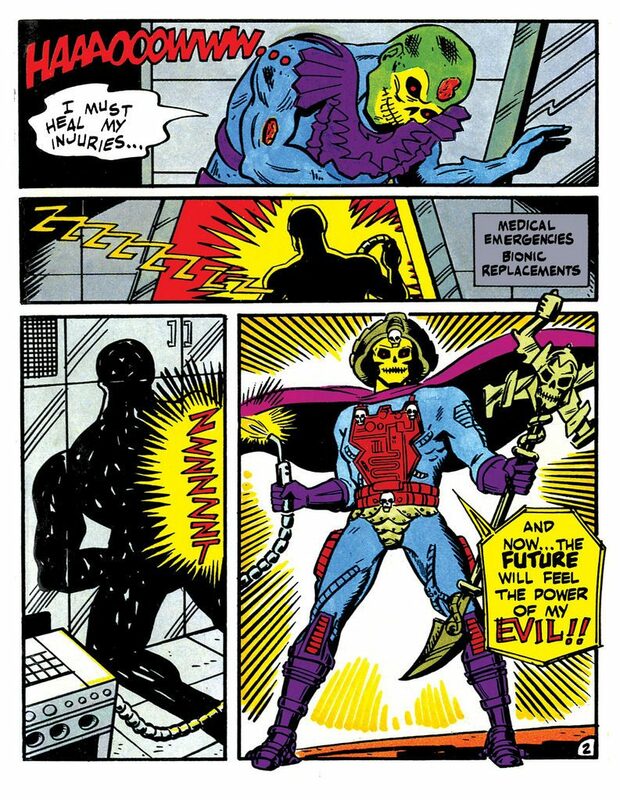 Skeletor has been transformed by lumina radiation absorbed in an atom-smashing explosion. 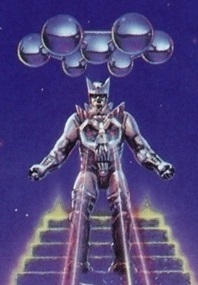 His eyes blaze with evil and his Battle Armor glows with power. 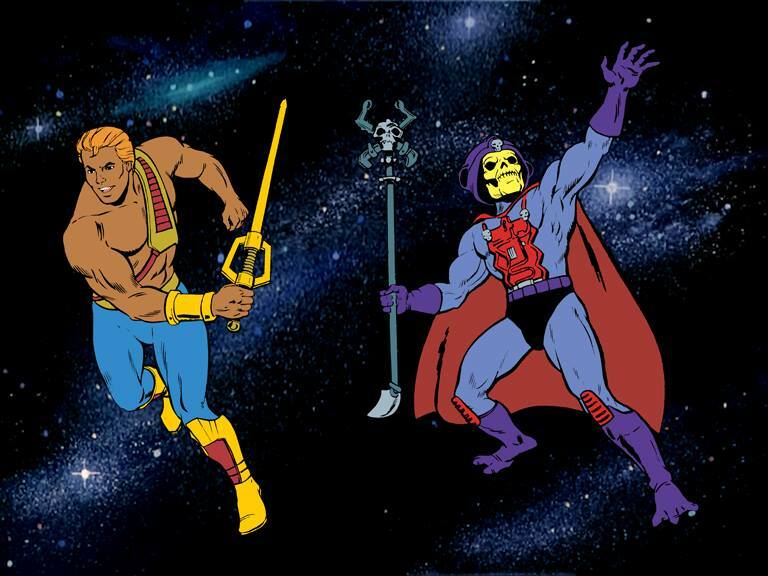 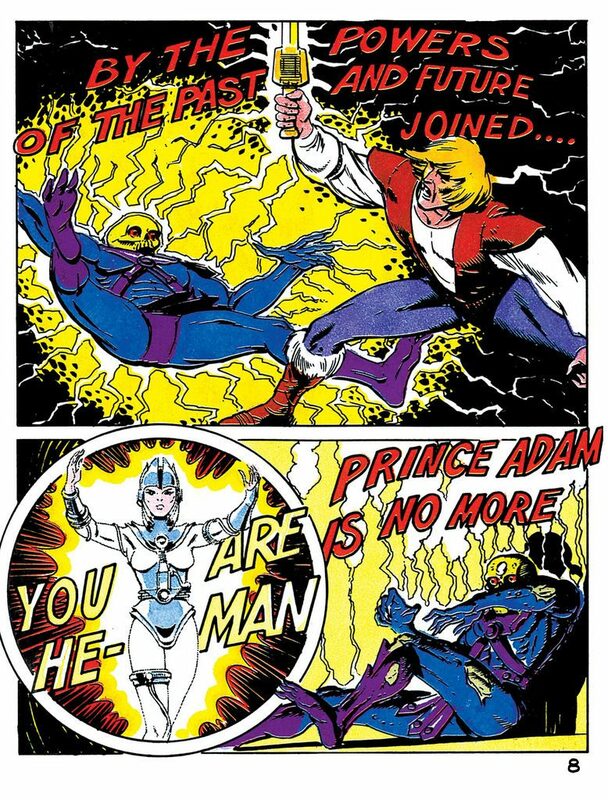 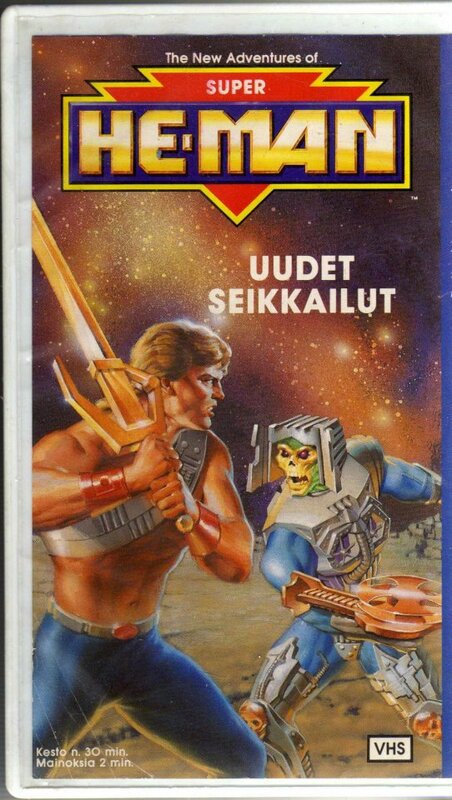 Mission: 1) To slice He-Man down to size and lead him to a shameful end at the Galactic Guardian Games on the planet Primus. 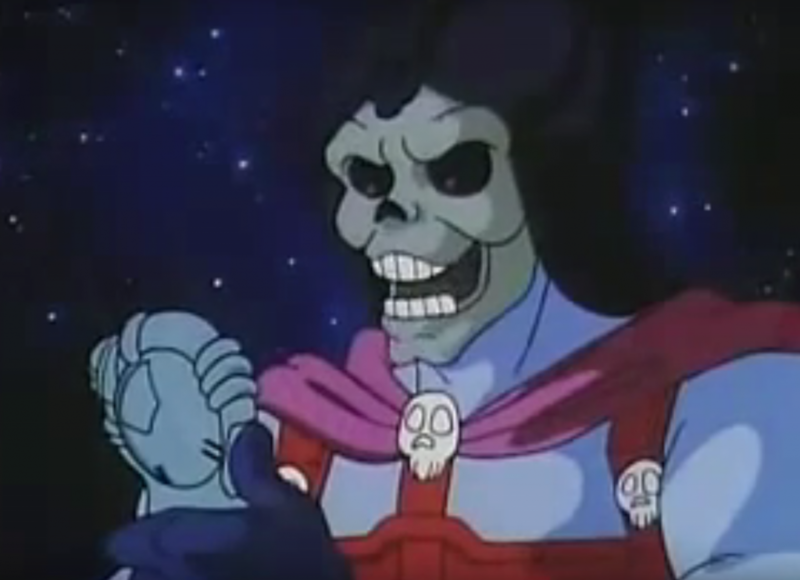 2) To seize all of the power in the universe. 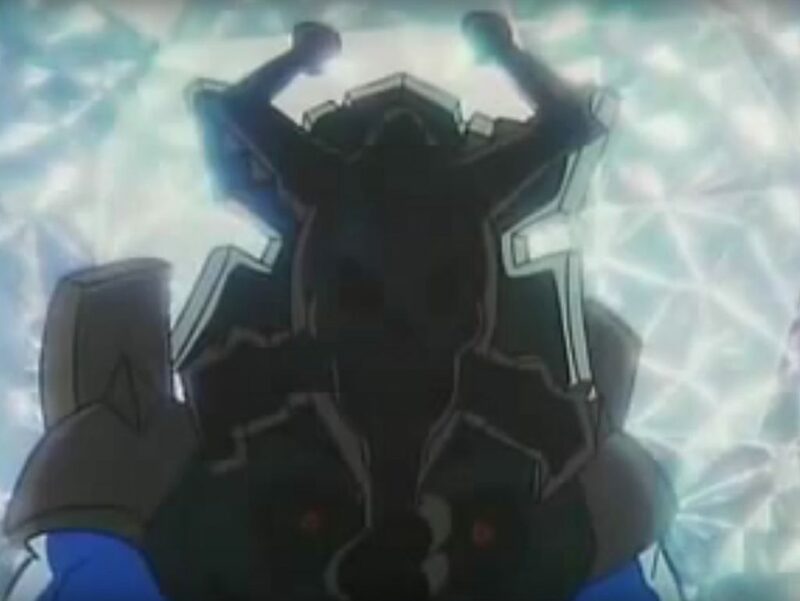 Battle Equipment: Quadro-blade, deflector shield & luminactive Battle Armor. 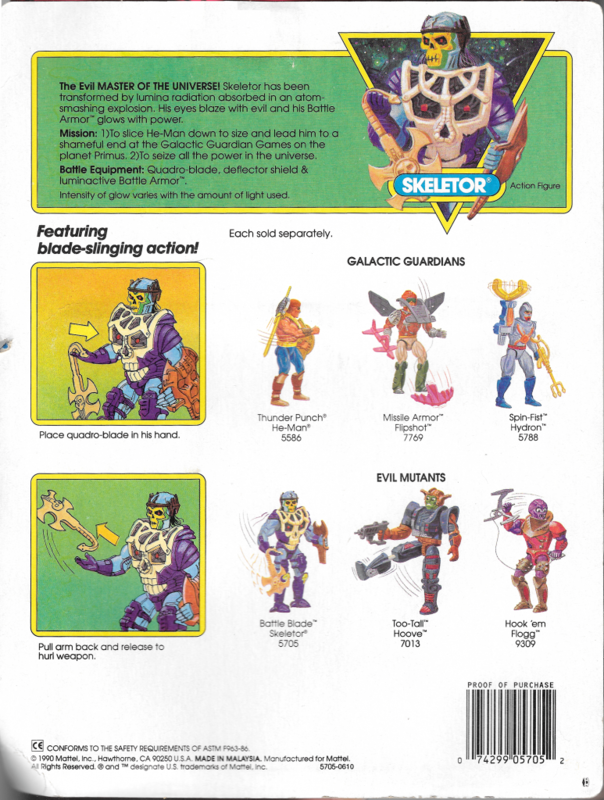 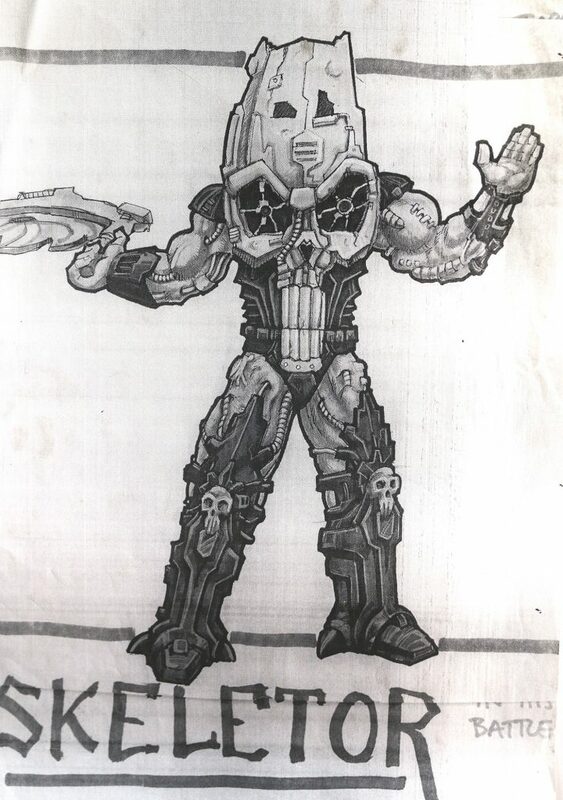 Battle Blade Skeletor production sketch from the animated series. 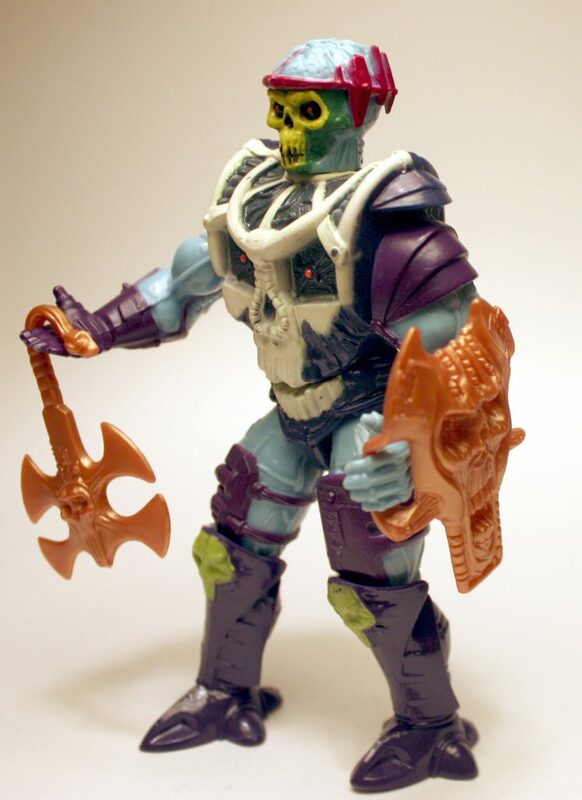 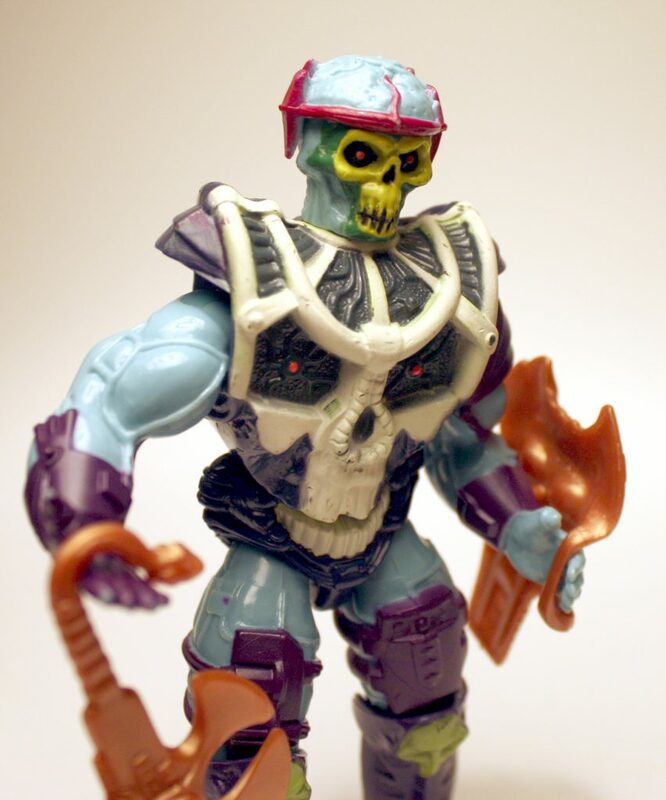 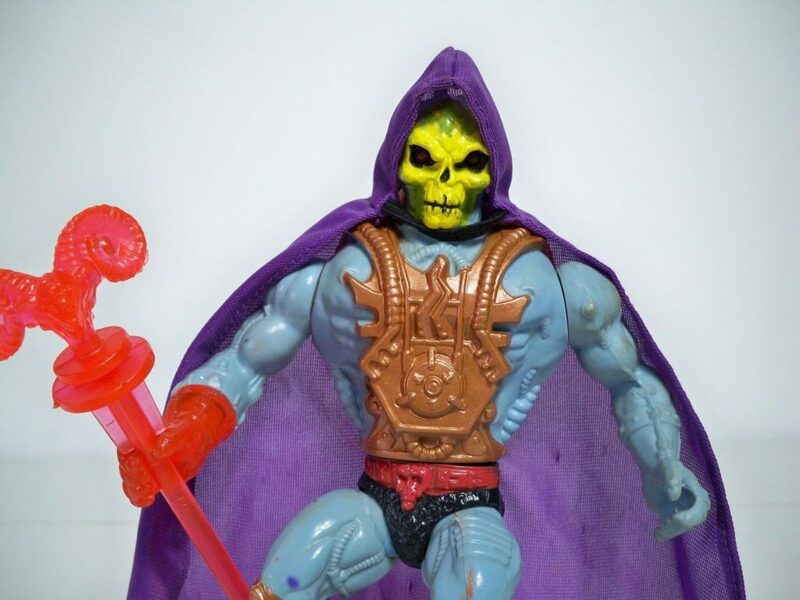 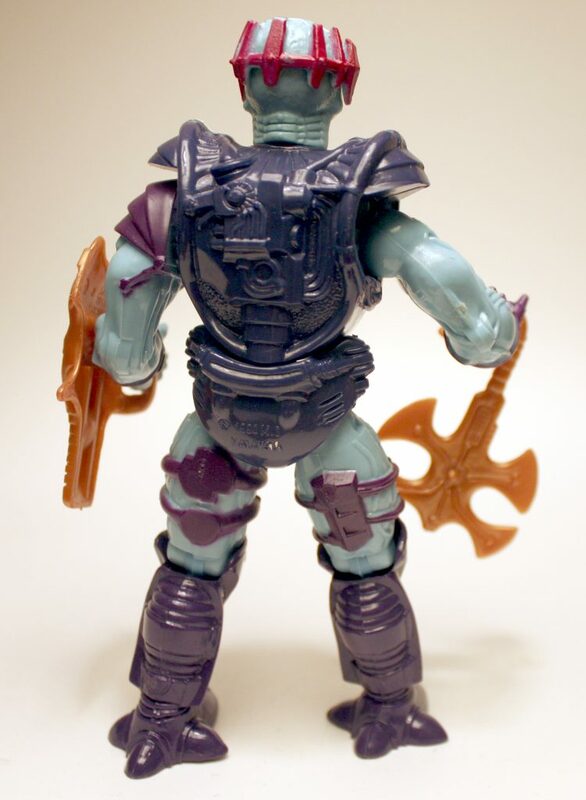 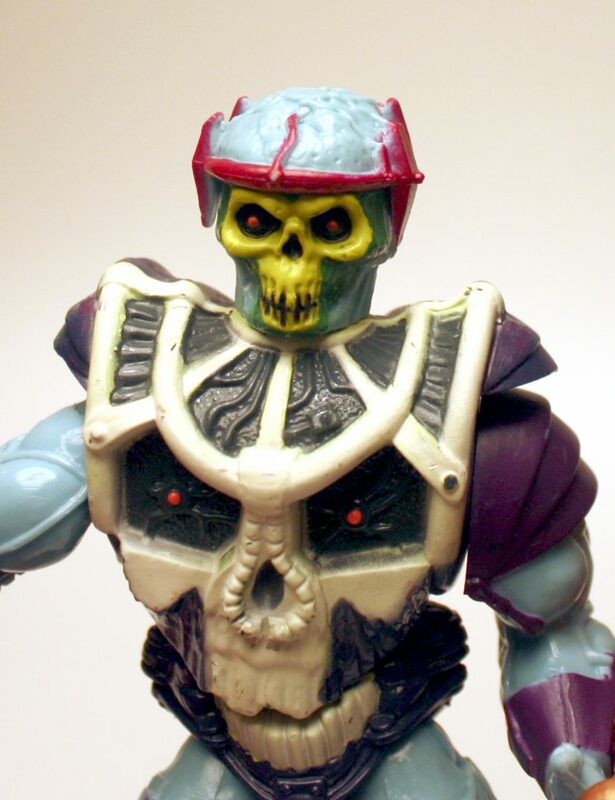 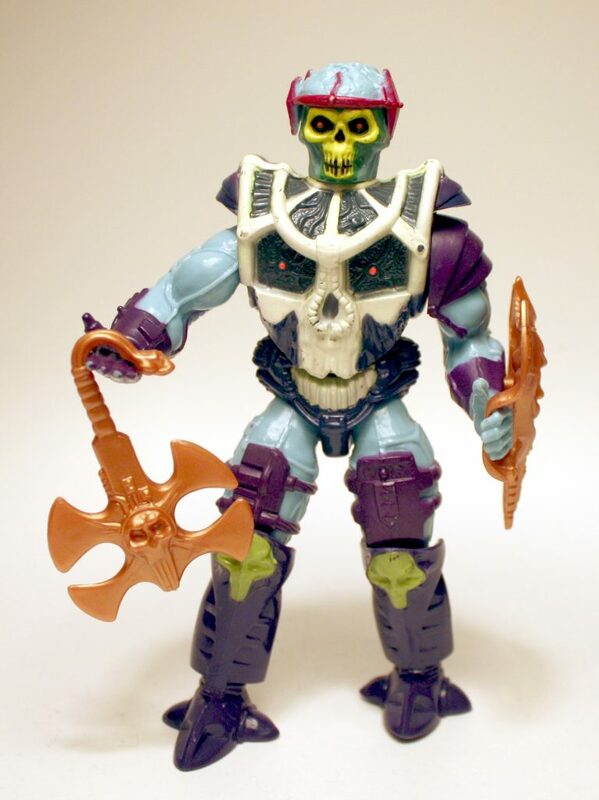 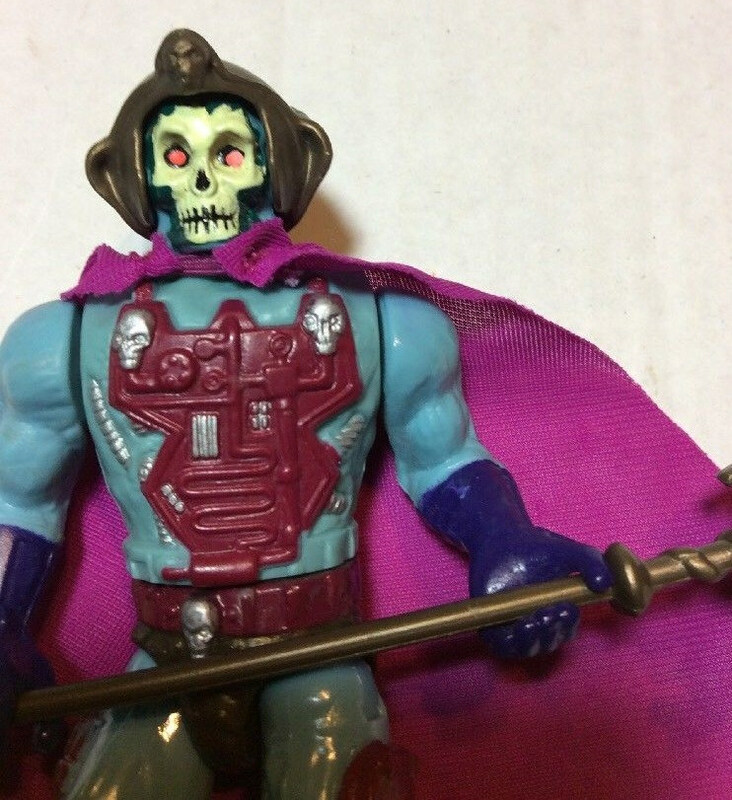 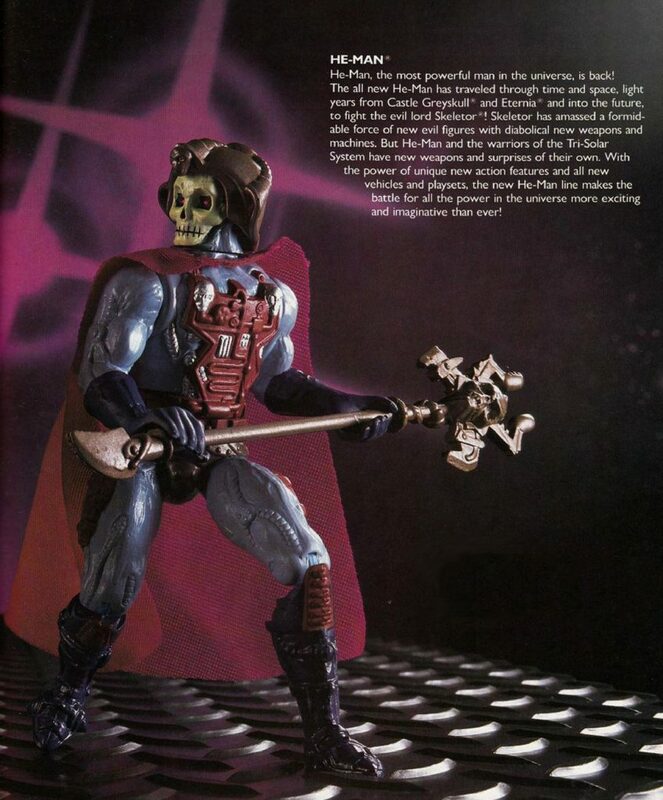 It’s strange to me that Mattel was still making Skeletor figures in the era of grunge music. 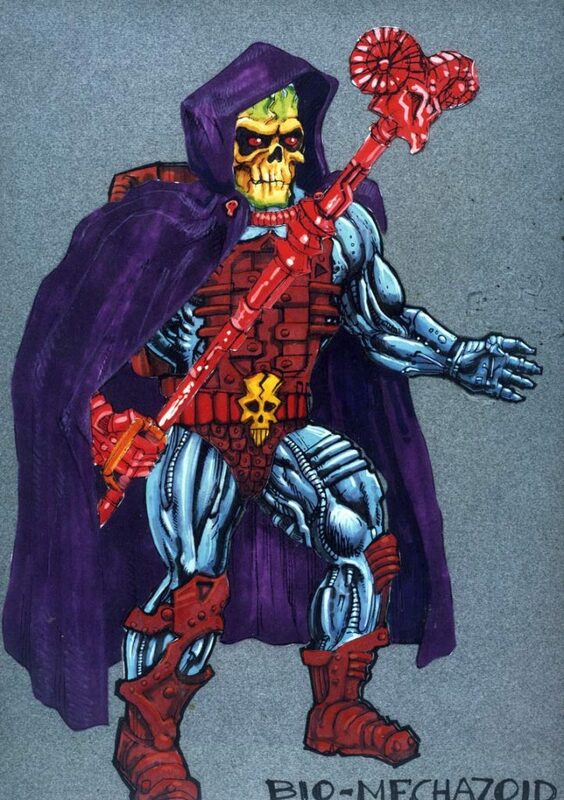 Come to think of it, this is certainly a grungy-looking figure, so he somewhat captures the spirit of the era.